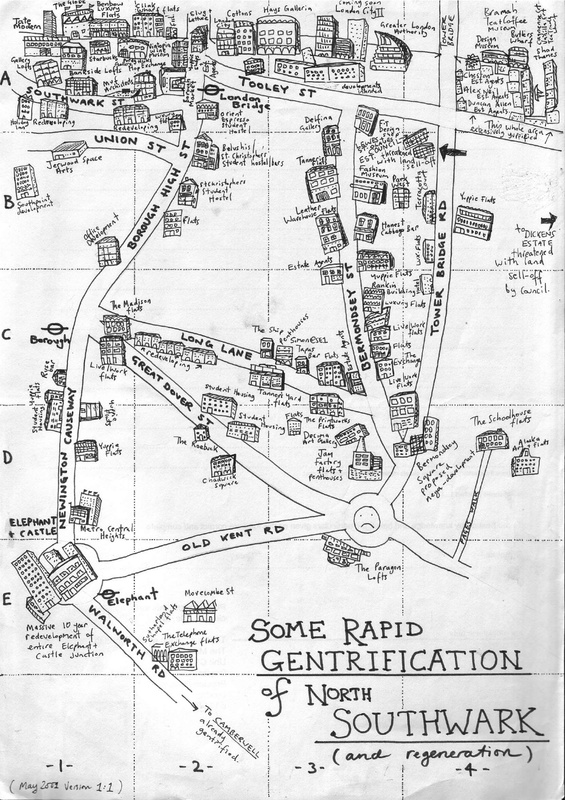 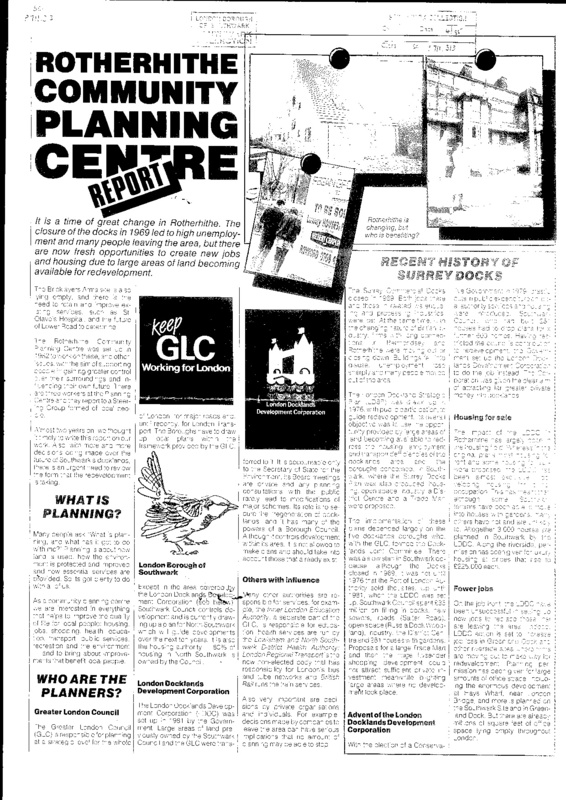 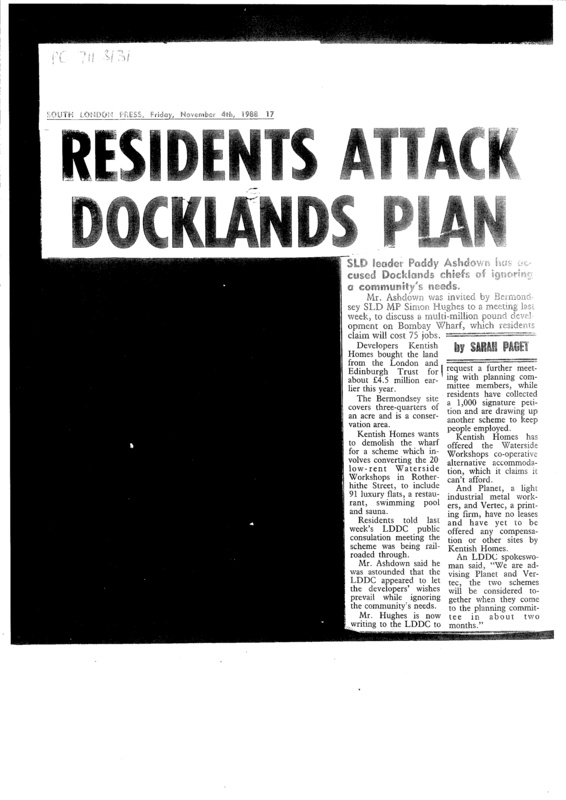 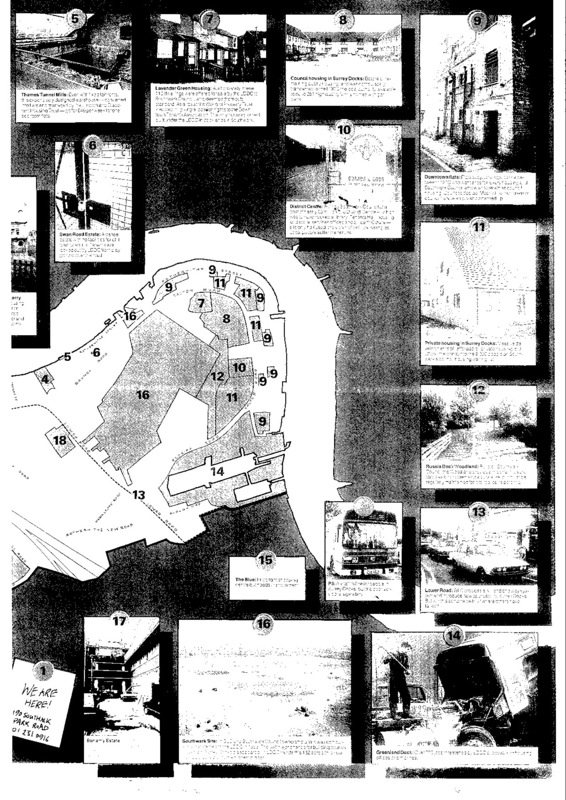 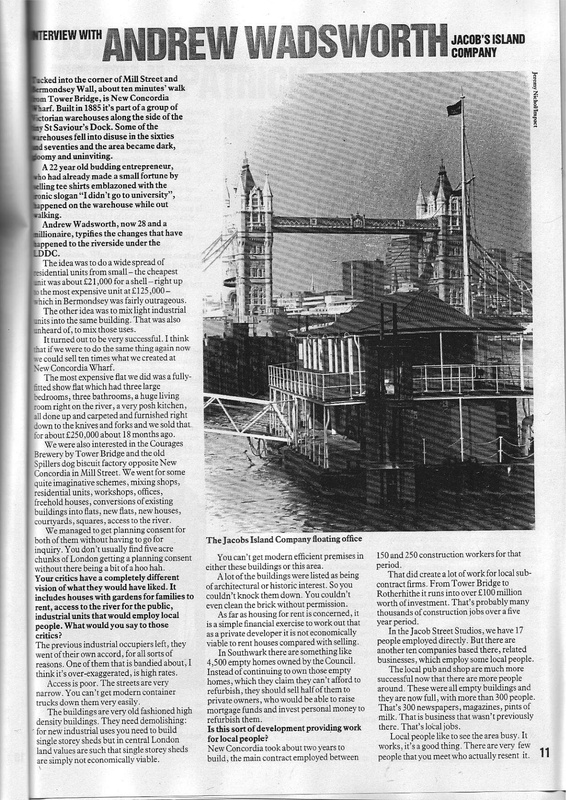 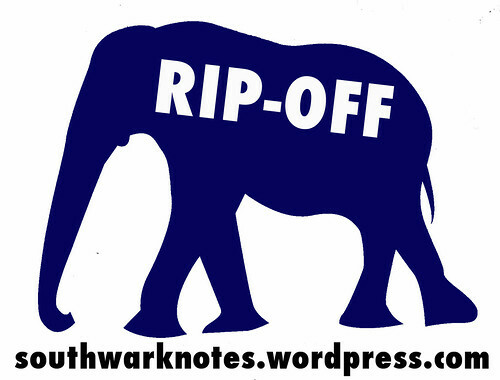 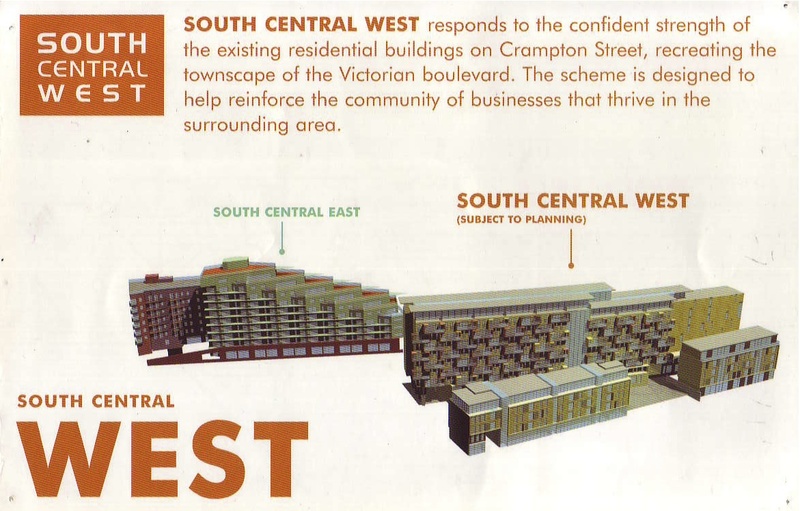 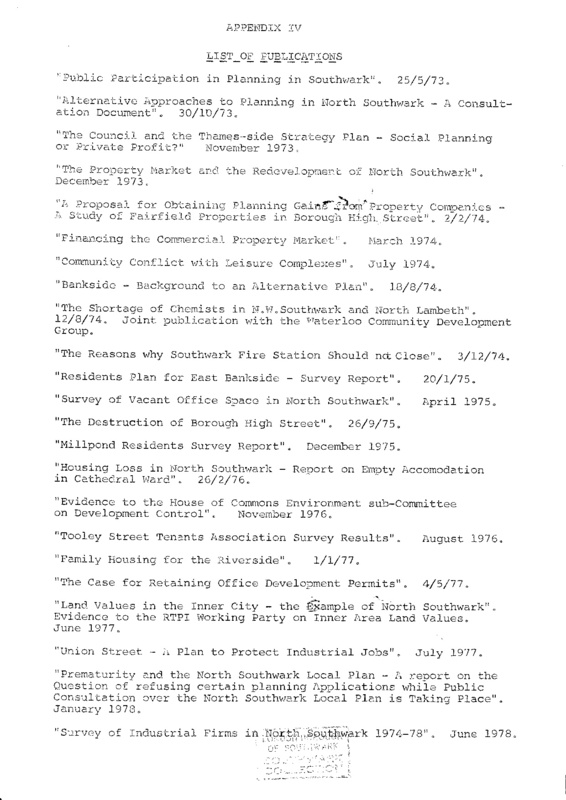 SOUTHWARK 1970-2014 | Southwark Notes - whose regeneration? 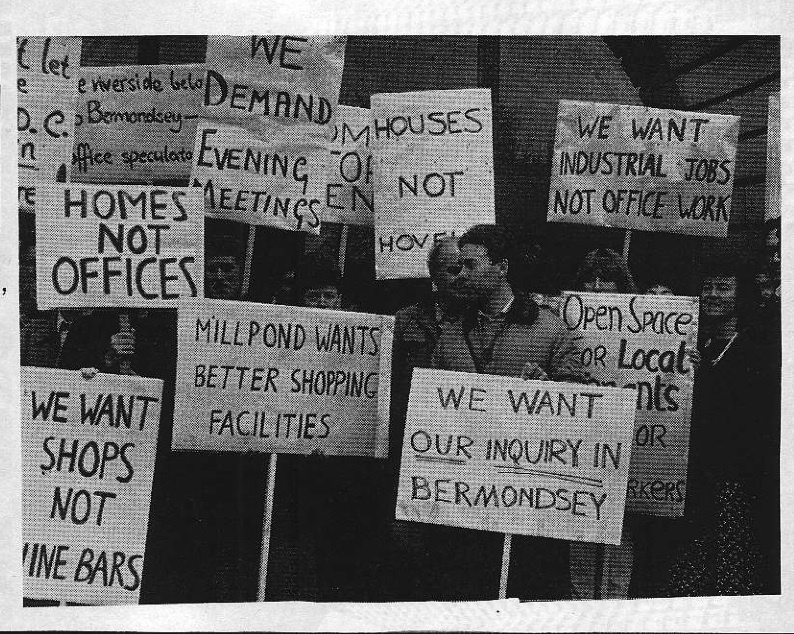 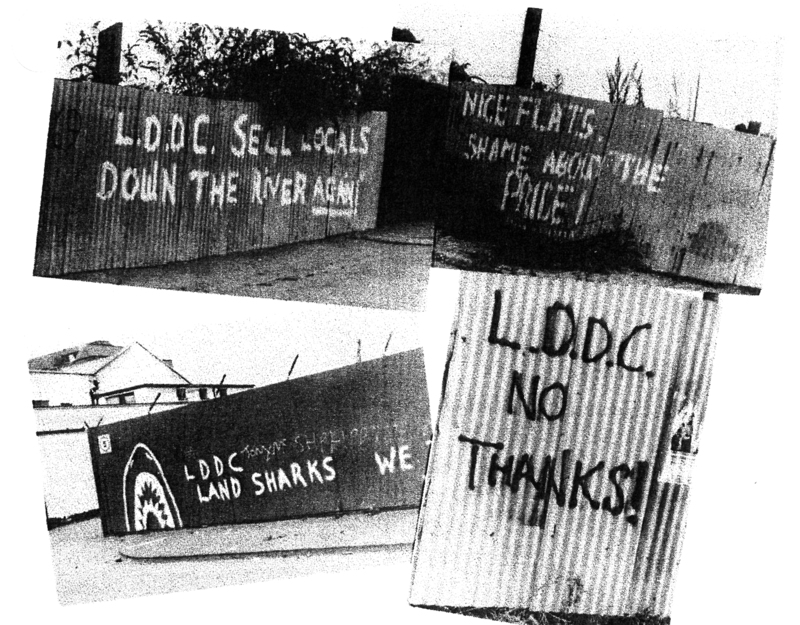 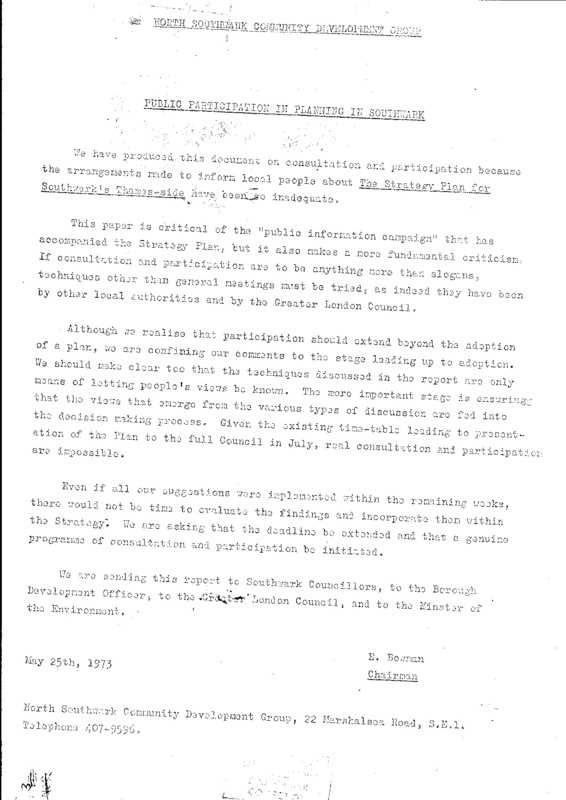 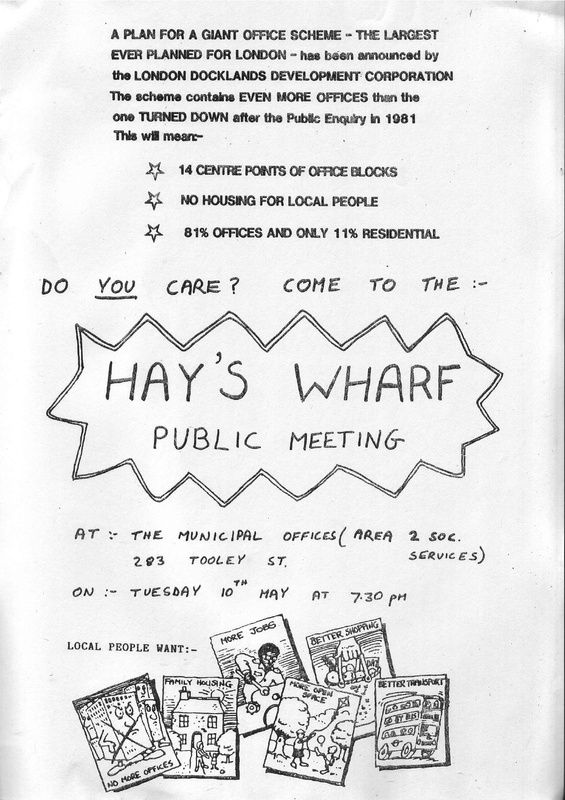 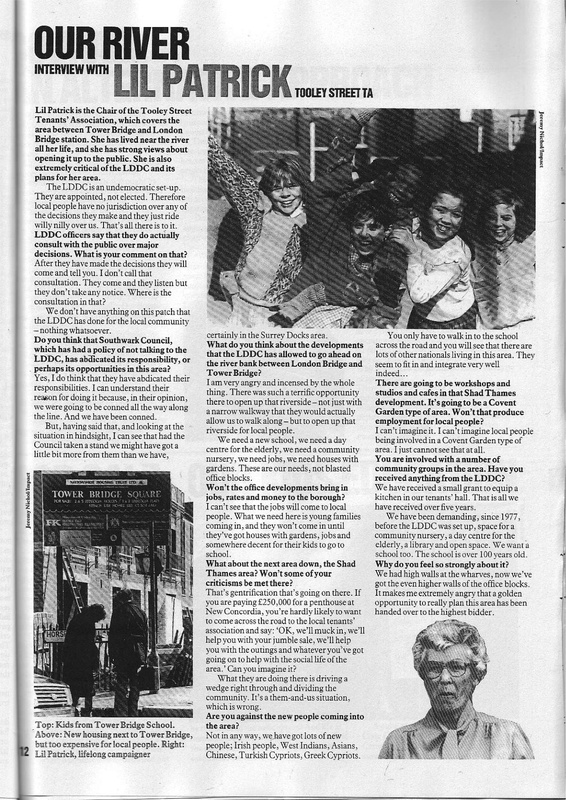 The 1970’s and 1980’s saw a lot of vigorous campaigning by local people organised both in local groups and in coalition projects such as the North Southwark Community Development Group. 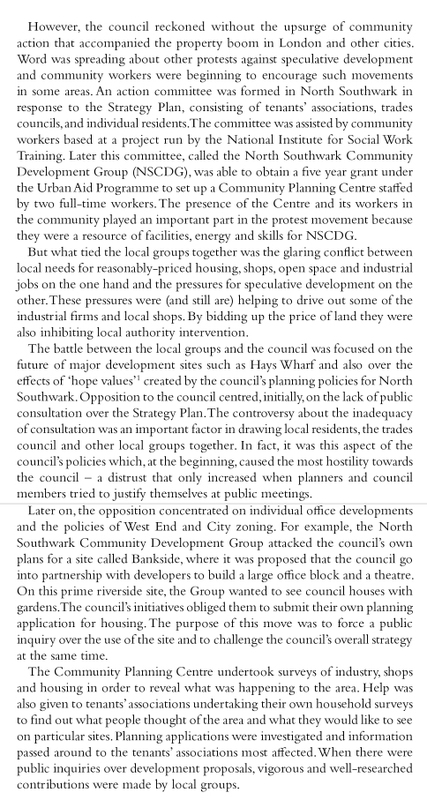 Not only were people active in challenging planning applications from major developers, they were also active on working together to understand, teach and agitate around plans that they thought would be detrimental to the lives of local people. 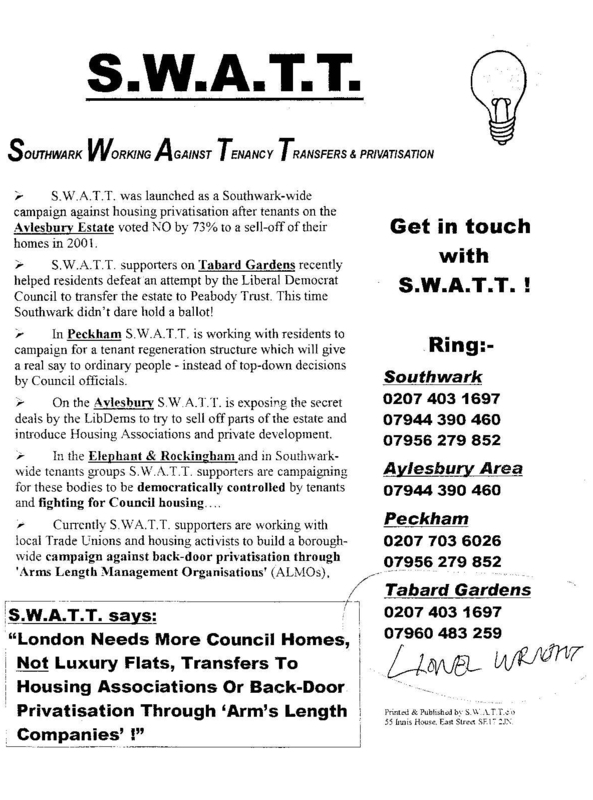 Front cover of ‘The Wire’, Squatters Network of Walworth & Southwark fortnightly paper from Oct 1985 – ‘Circulation 1000’. 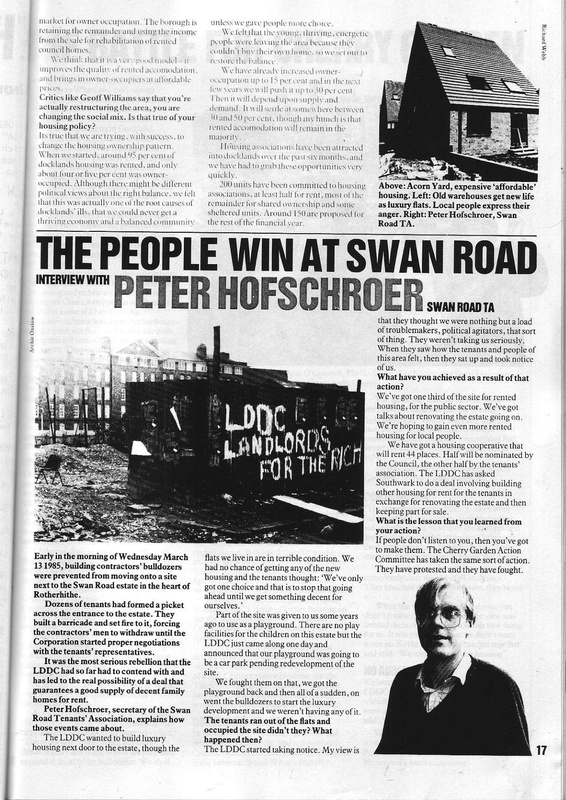 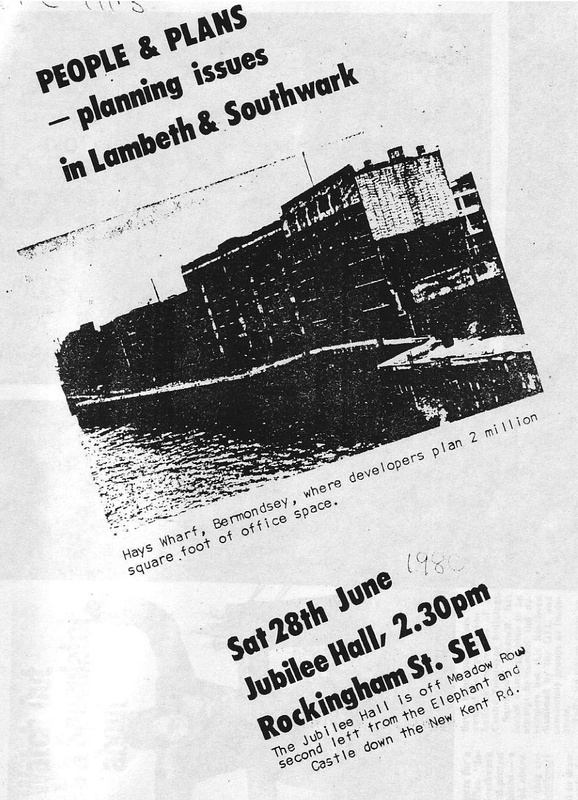 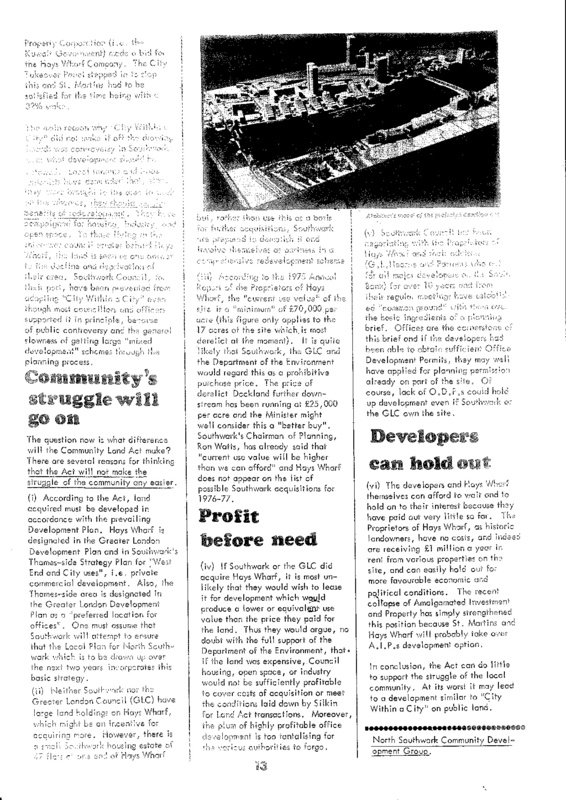 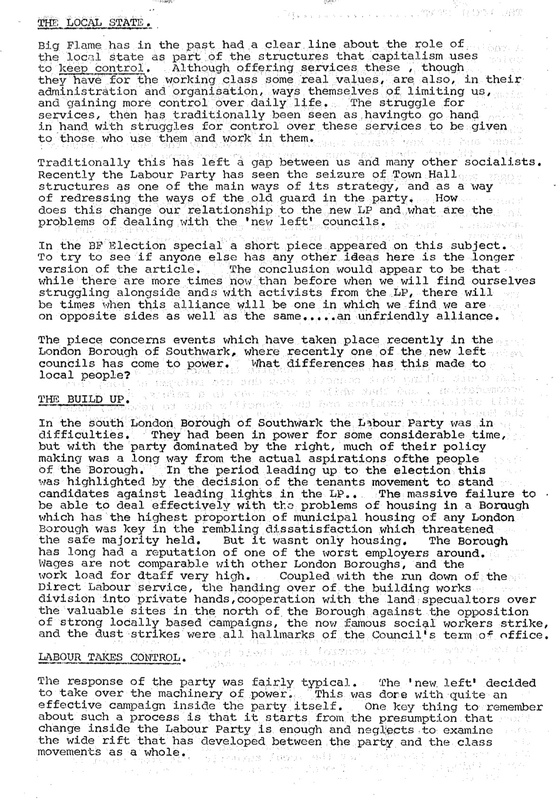 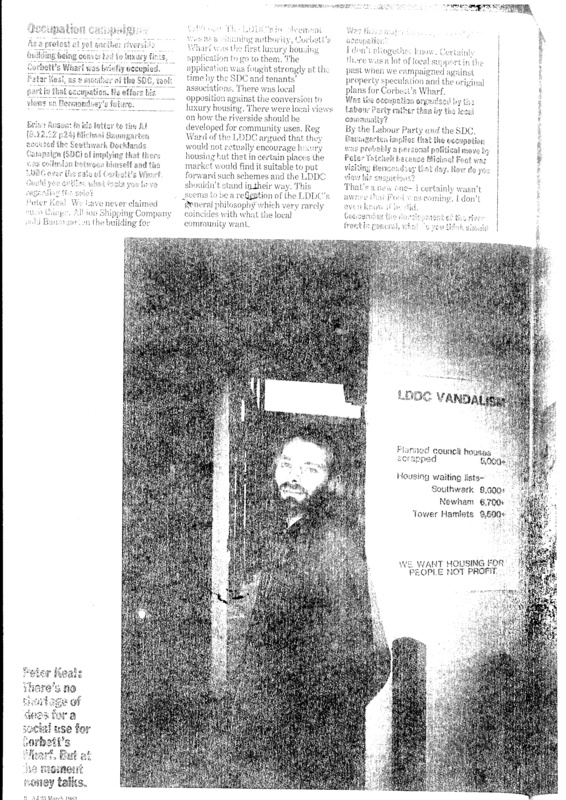 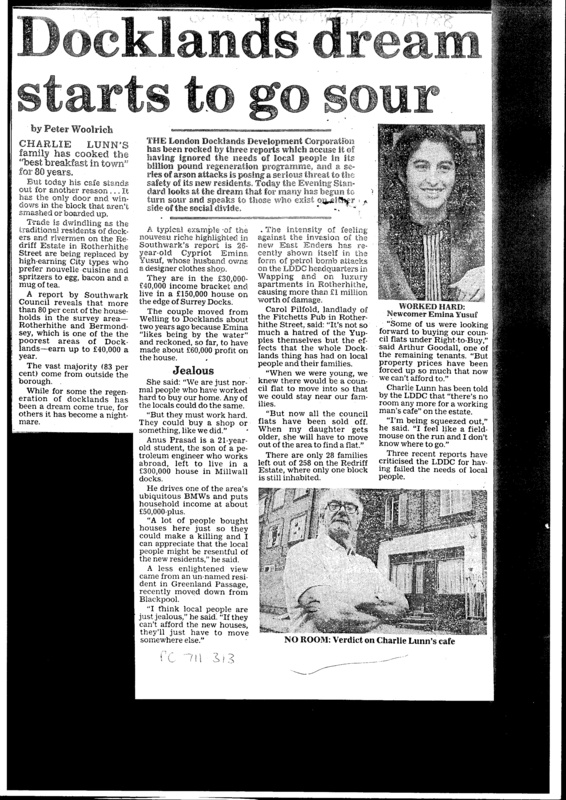 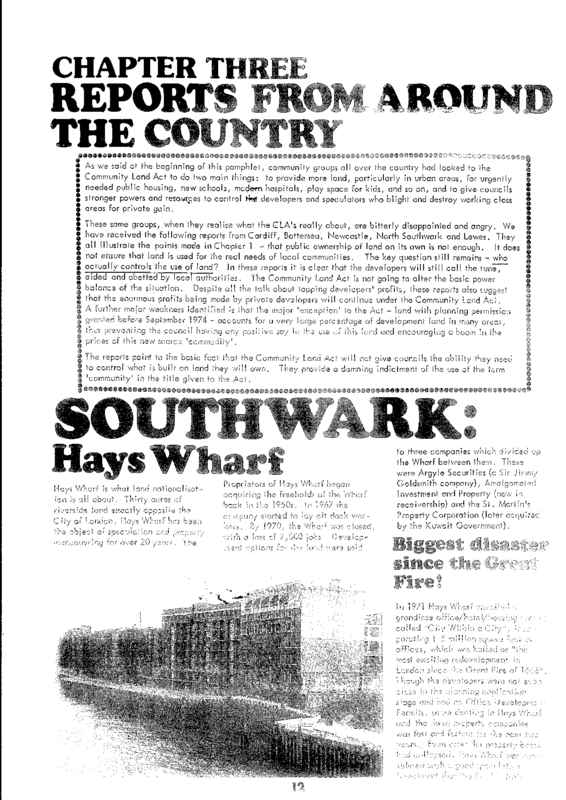 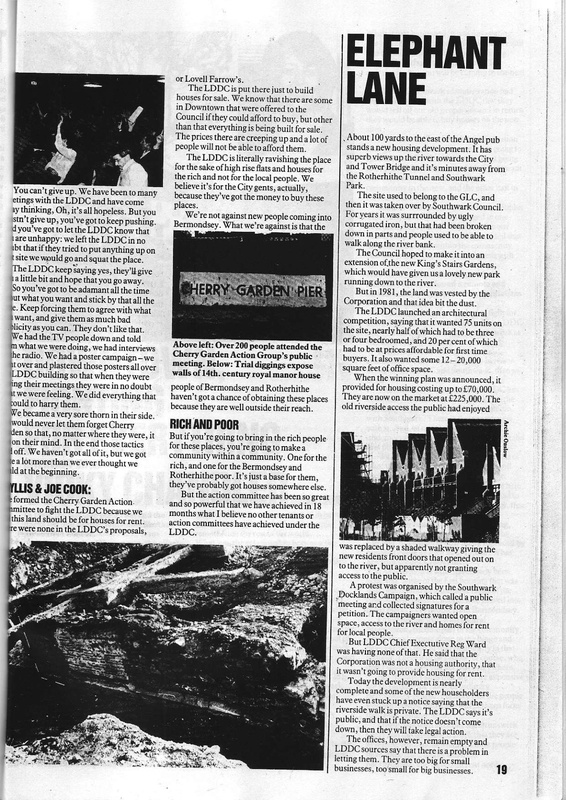 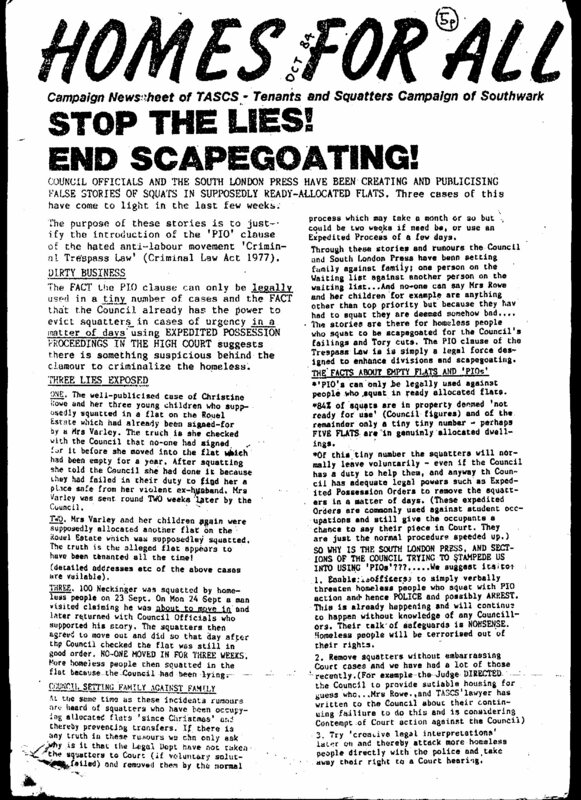 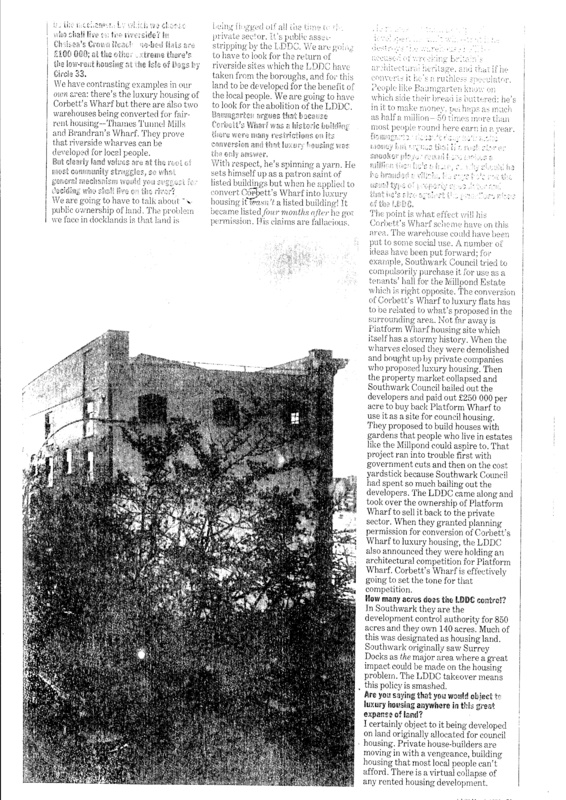 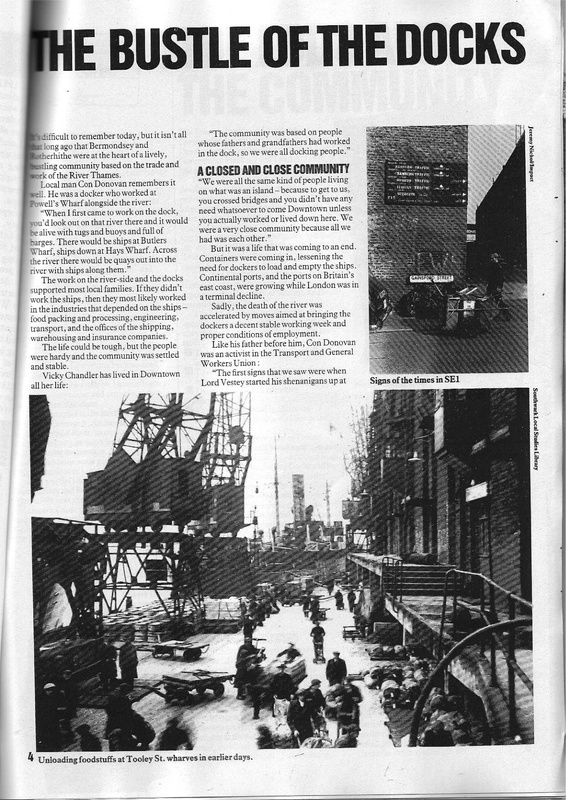 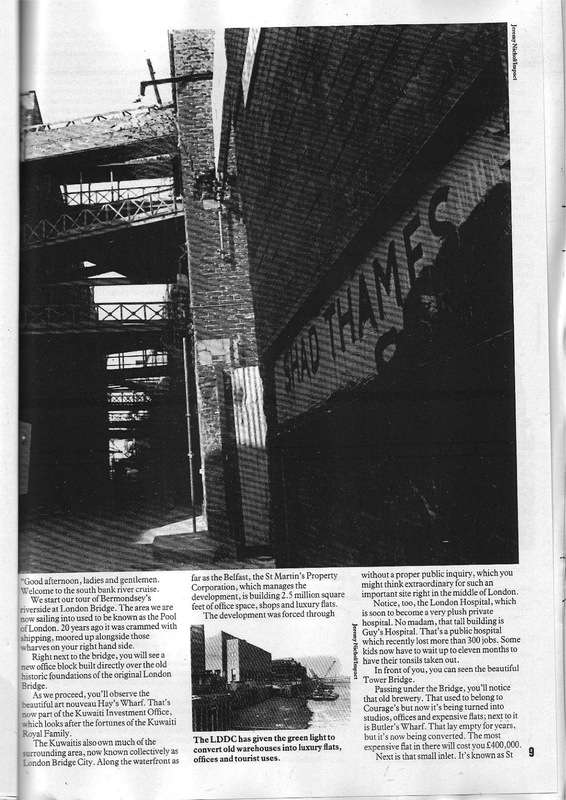 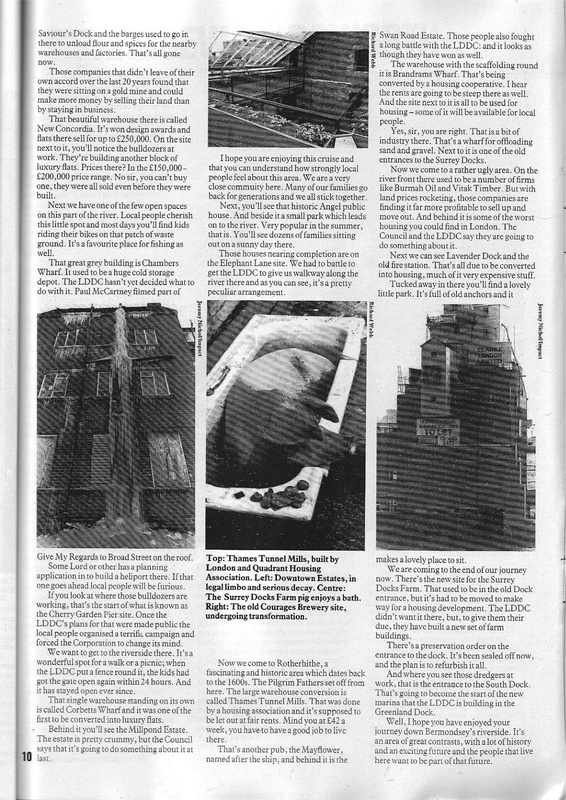 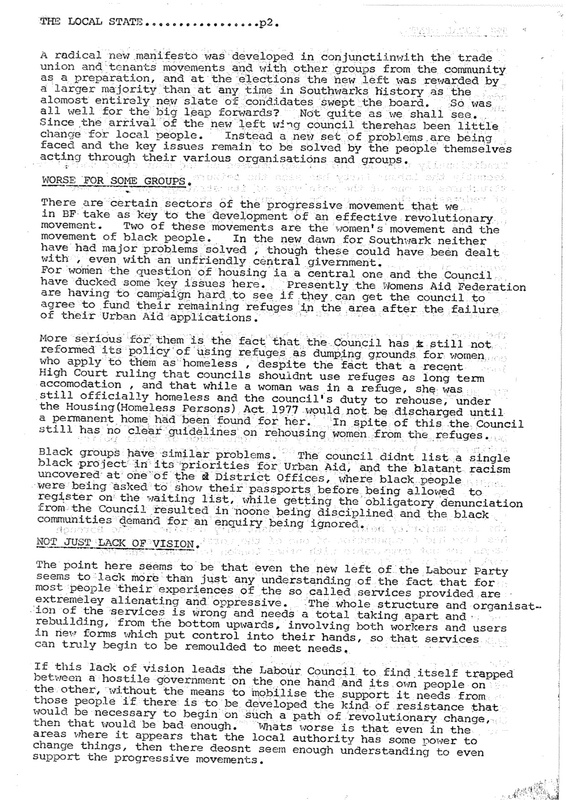 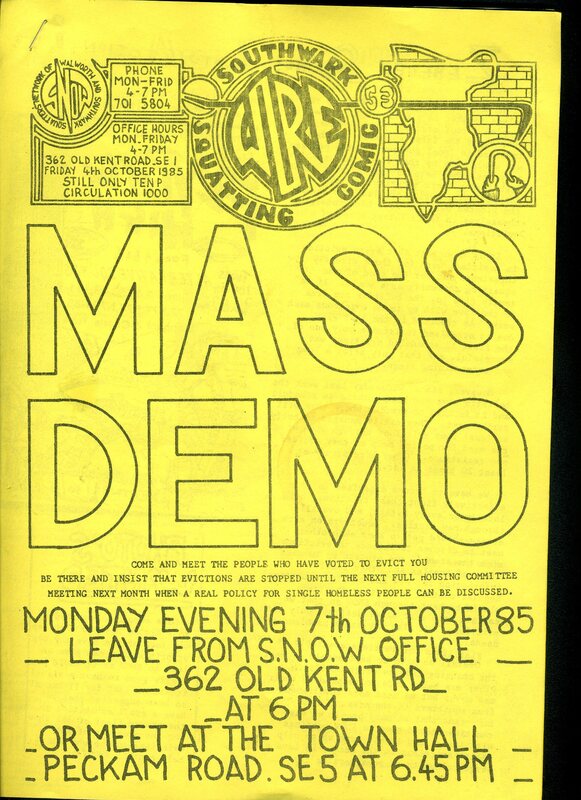 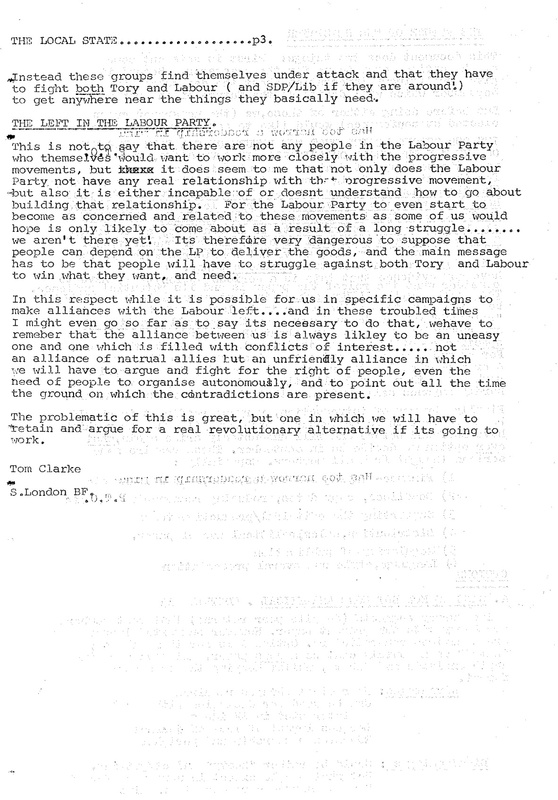 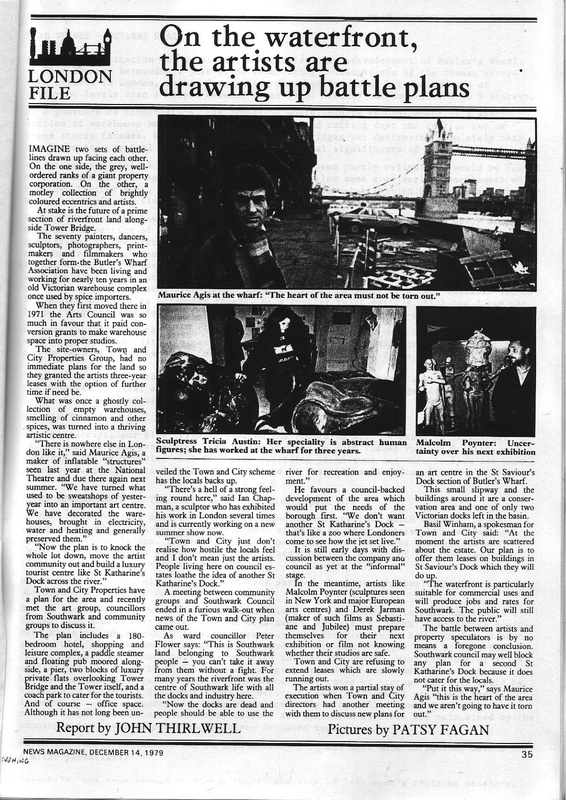 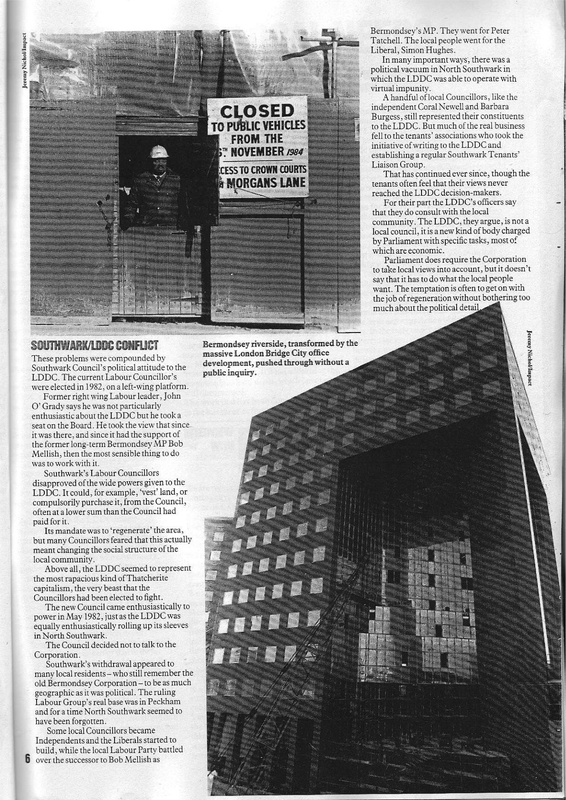 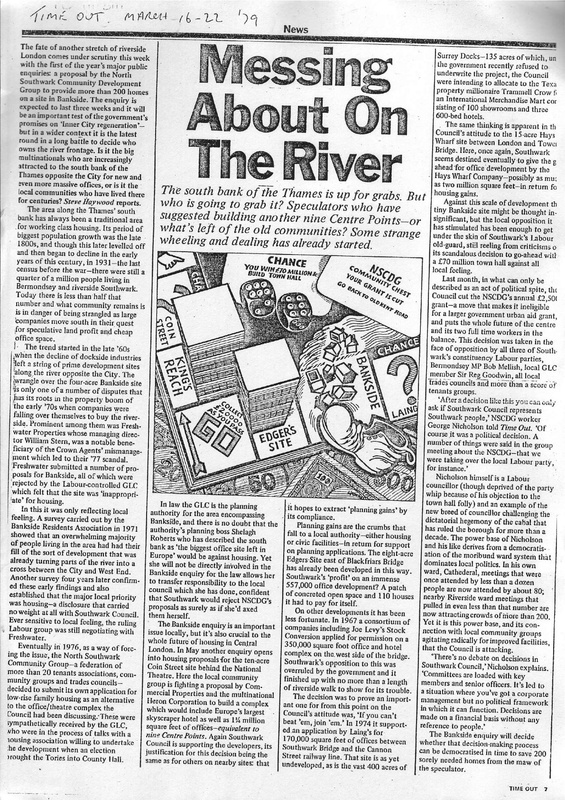 There was a mass and well organised squatting movement in Southwark in the 80’s and early 90’s occupying empty council flats who had often been empty for six months or even years / ‘Homes For All’, paper of the TASCS – Tenants and Squatters Campaign of Southwark (Oct 1984). 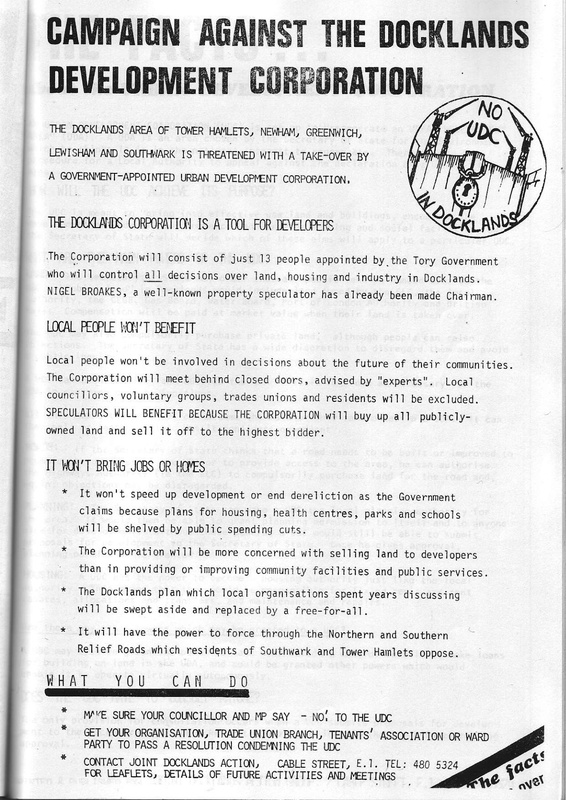 Numerous estates saw large squatting campaigns such as Rockingham, Pullens, Kinglake, Friary and so on. 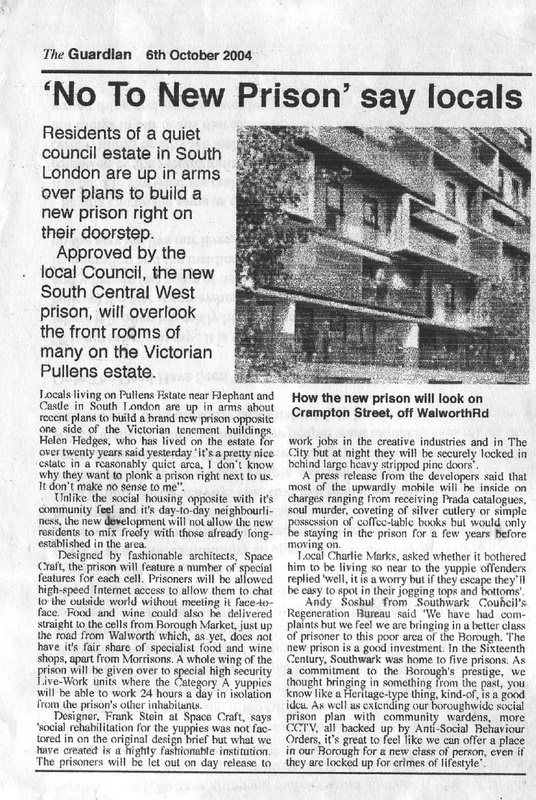 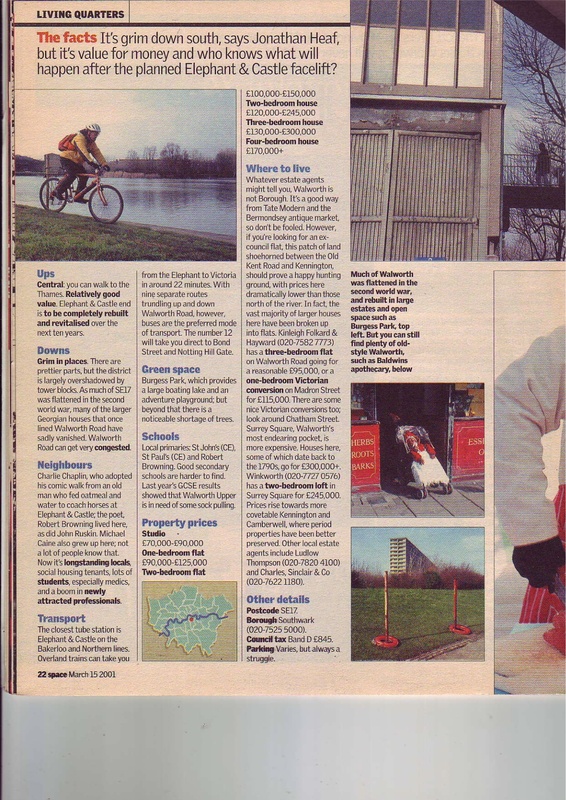 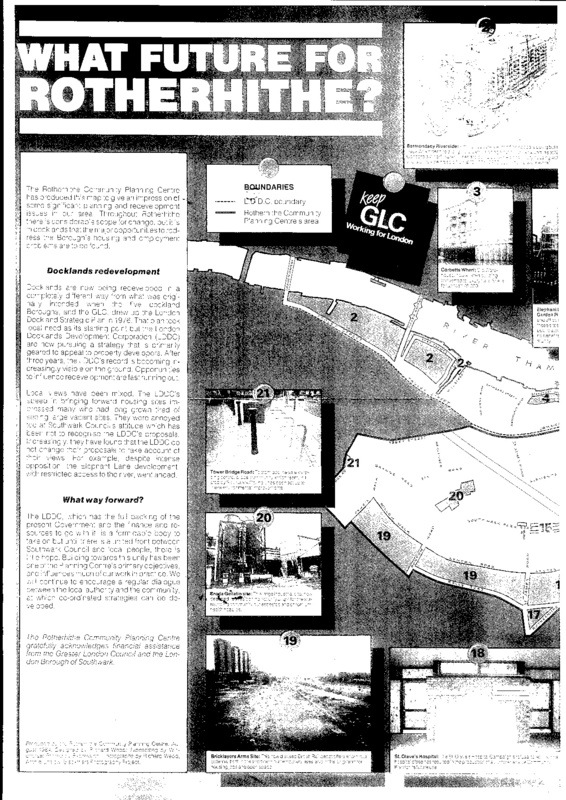 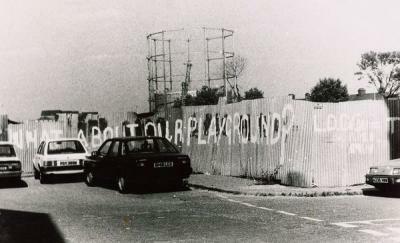 1988 North Peckham regeneration across 5 Estates. 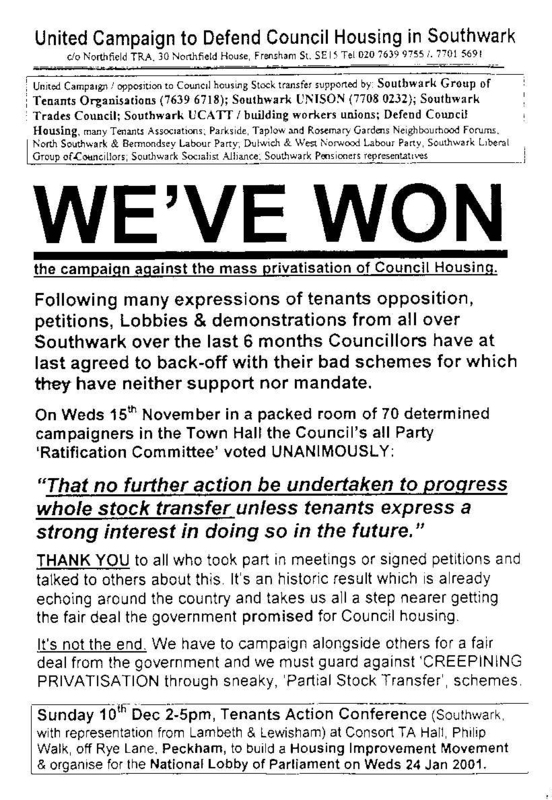 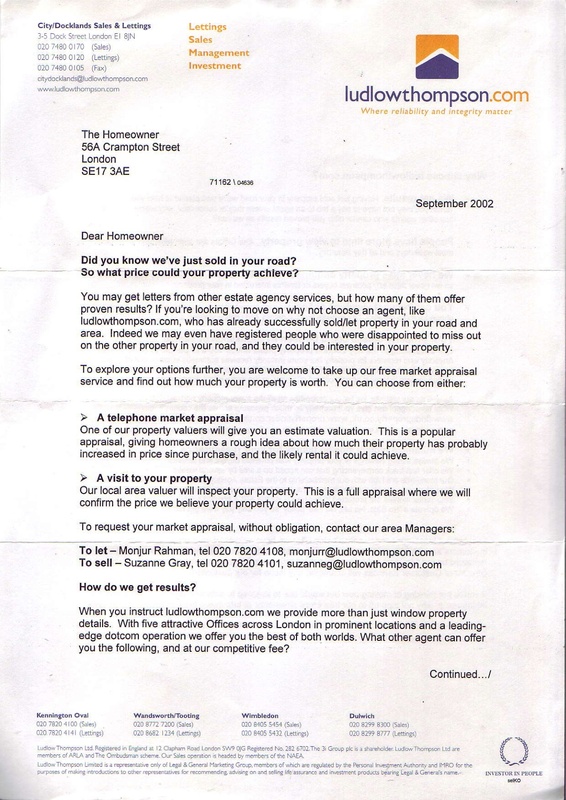 Tenants response to attempt by Government to impose a Housing Action Trust on the estates. 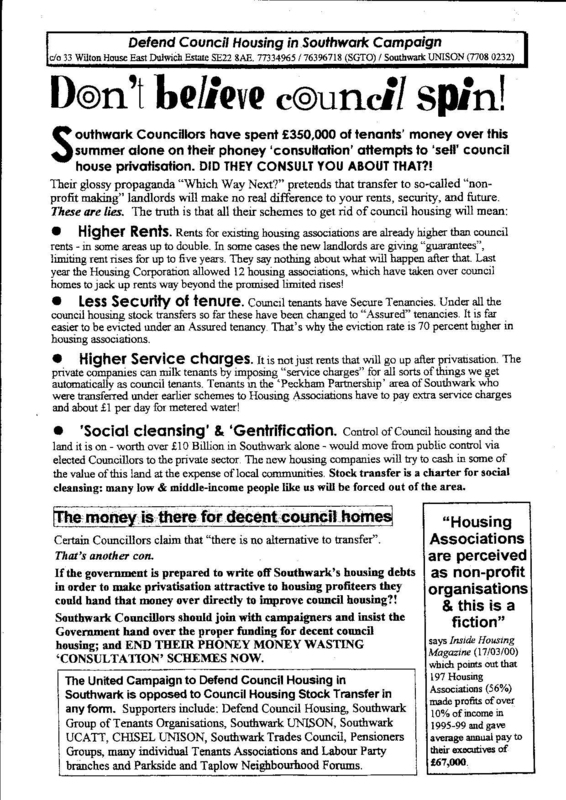 This video, commissioned by Southwark Council, looks at housing issues in the borough. 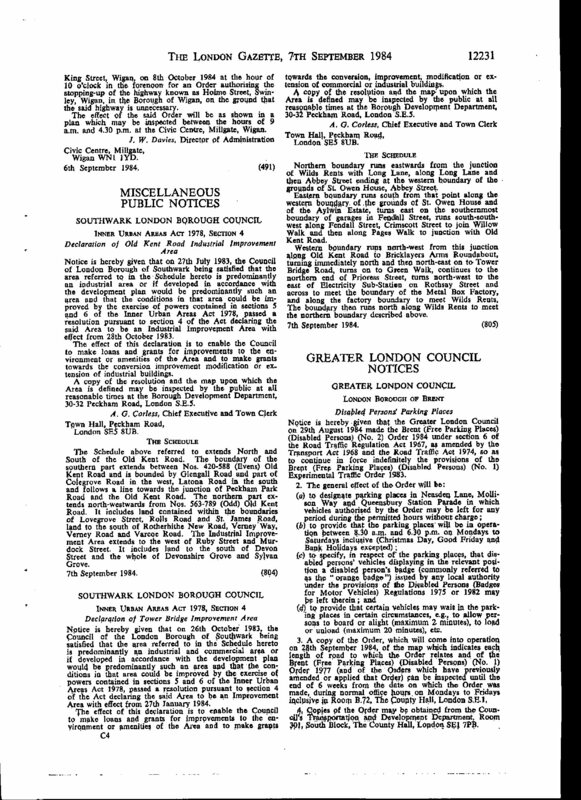 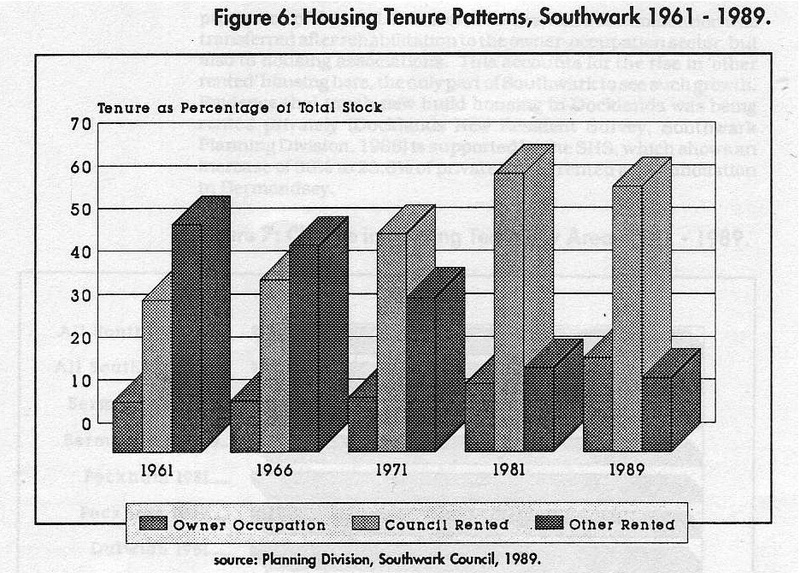 With 62,000 properties, Southwark has the largest council housing stocks in the country, of which a large proportion is flats built prior to WWII. 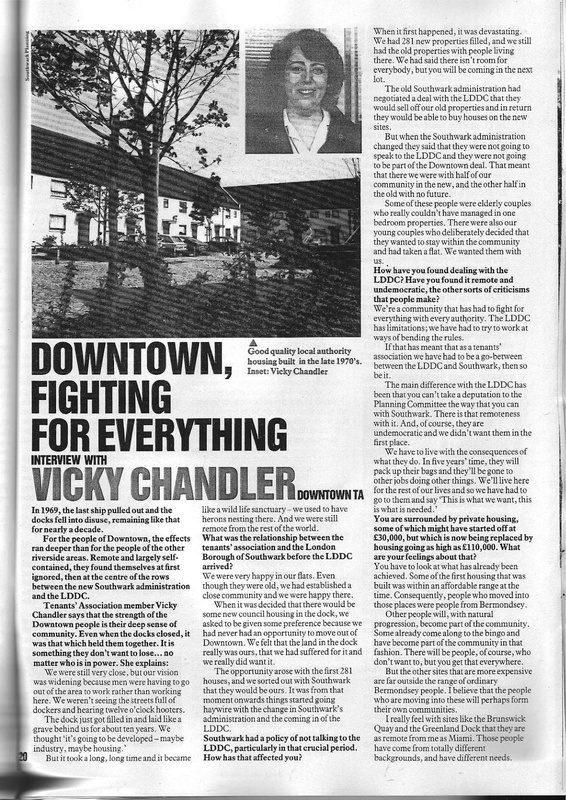 Residents, representatives of tenants associations, and officials are interviewed about the problems and the reasons for them. 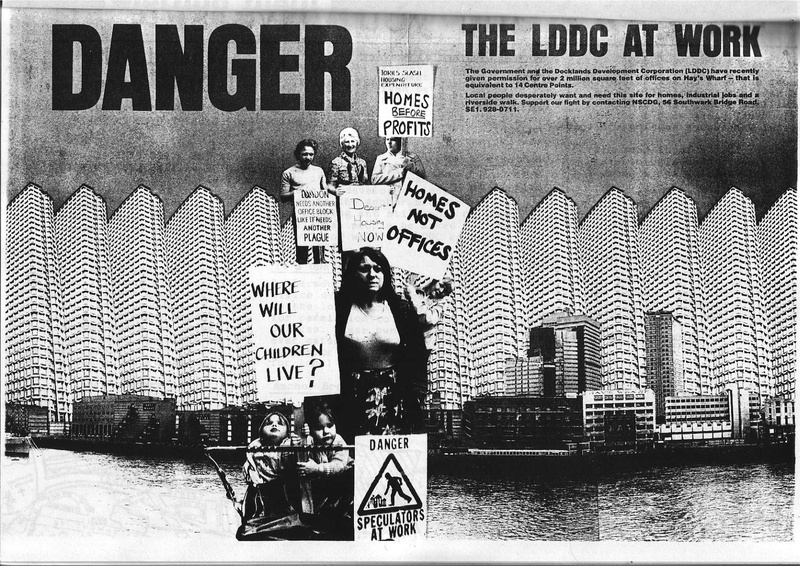 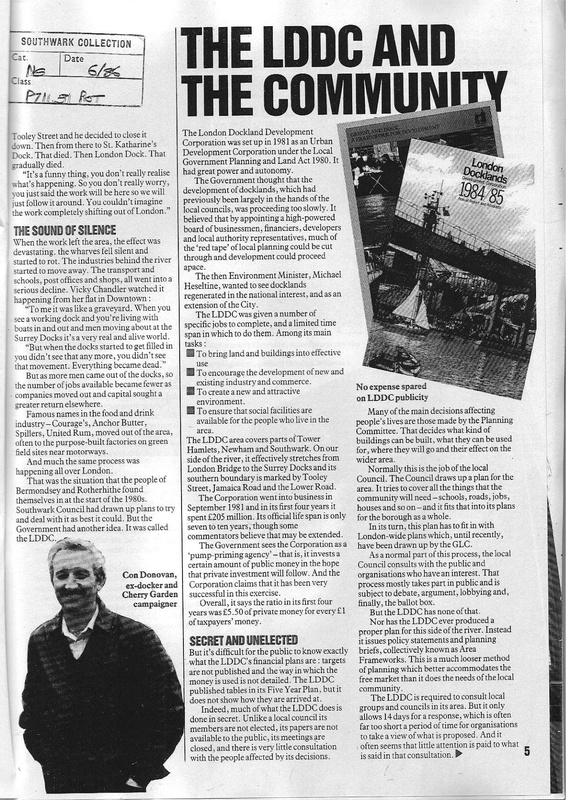 By the time we get to the 1990’s, locally organised housing groups and community planning movements have more or less died out or become to seem like something from another age even though the issues, threats and problems development brings to the different local communities is no different from the older struggles around Bermondsey and The Borough. 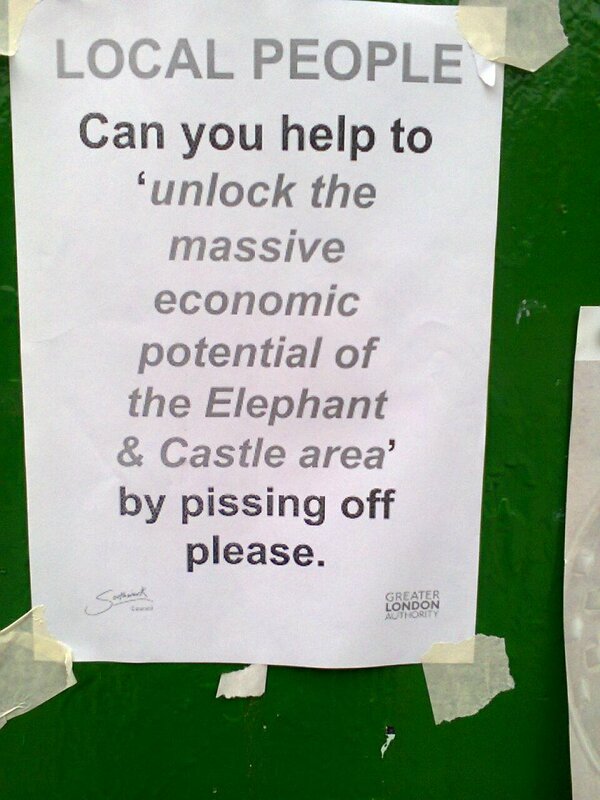 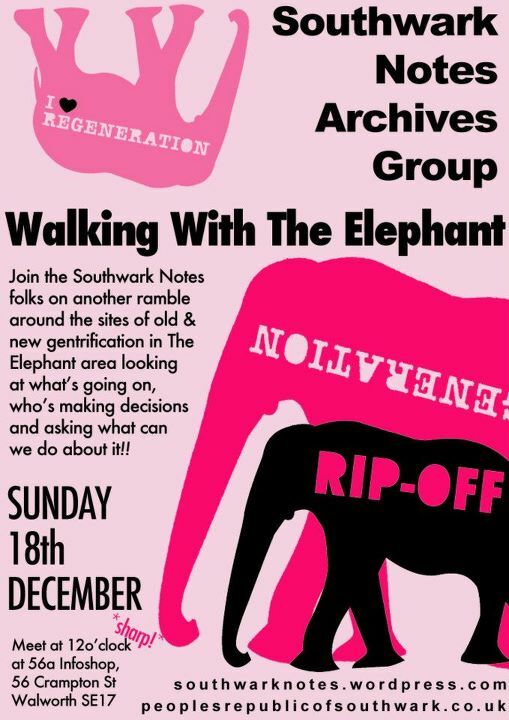 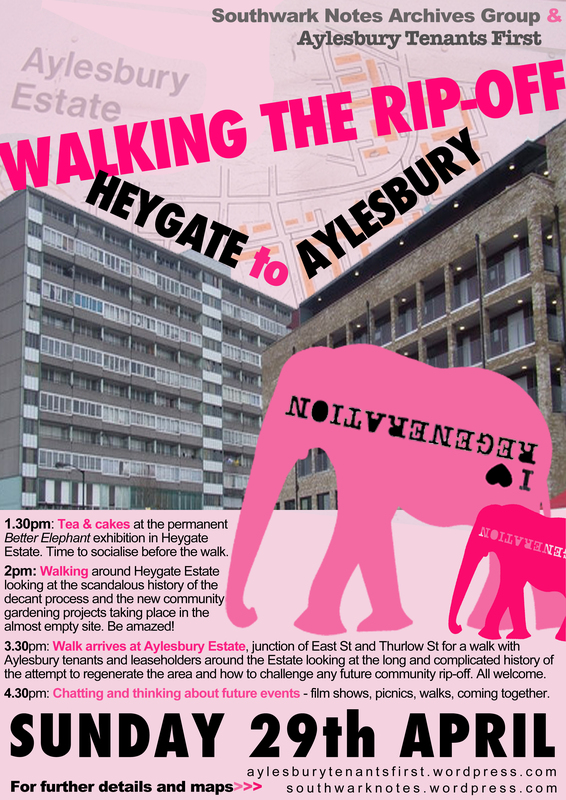 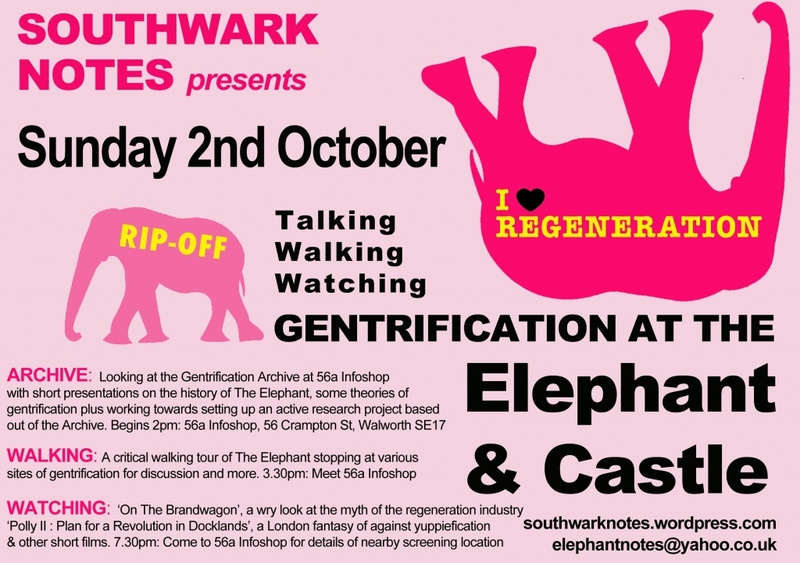 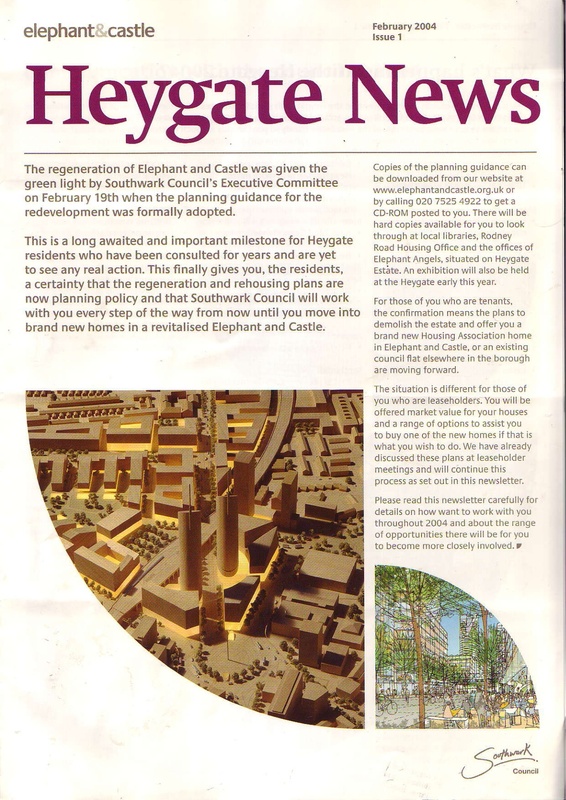 The early struggle over the regeneration of The Elephant and Heygate Estate were particularly dynamic although these had waned by the time the second attempt at a large developing of The Elephant restarts around 2004. 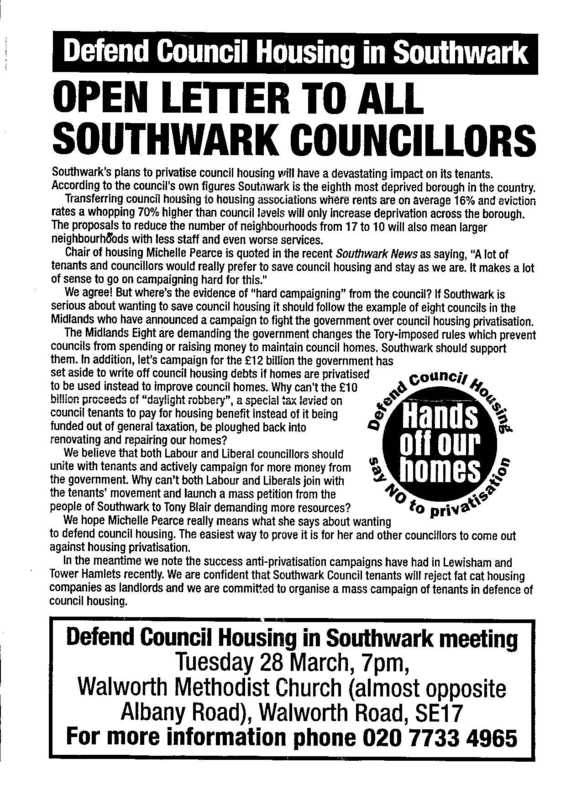 One of the few national campaigns Defend Council Housing has worked hard on stopping sell-offs and stock transfer of council homes. 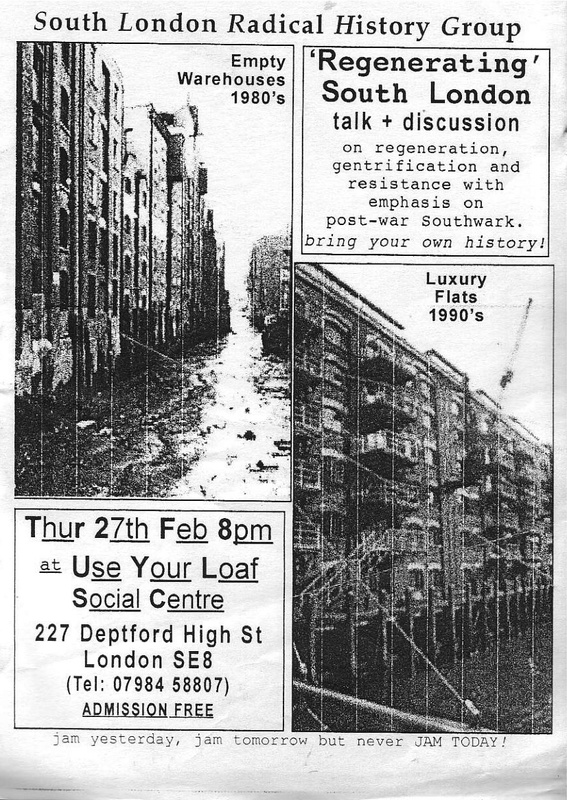 Squatter movements and squatter / tenant coalition ‘Homes For All’ campaigns, much bigger in the 1980’s, have also become marginal. 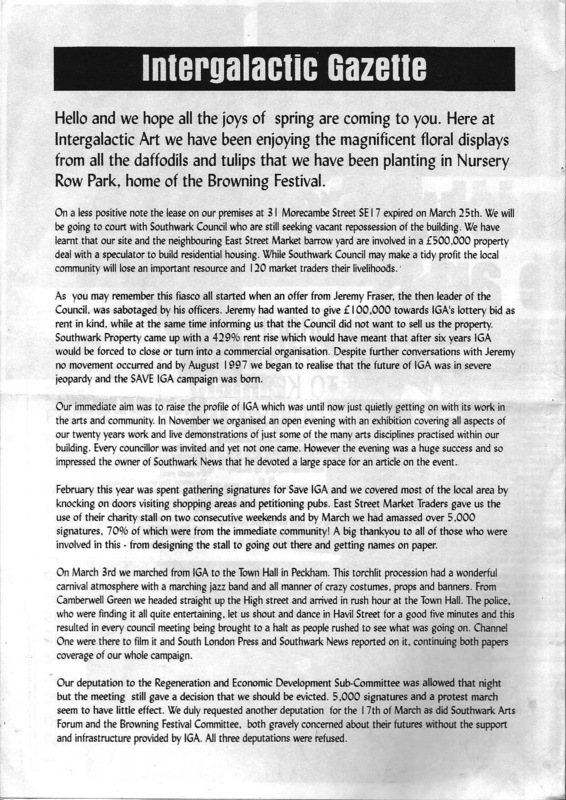 IGA, the popular Intergalactic Arts community space on Morecombe St was evicted for new build homes despite a big campaign to save it. 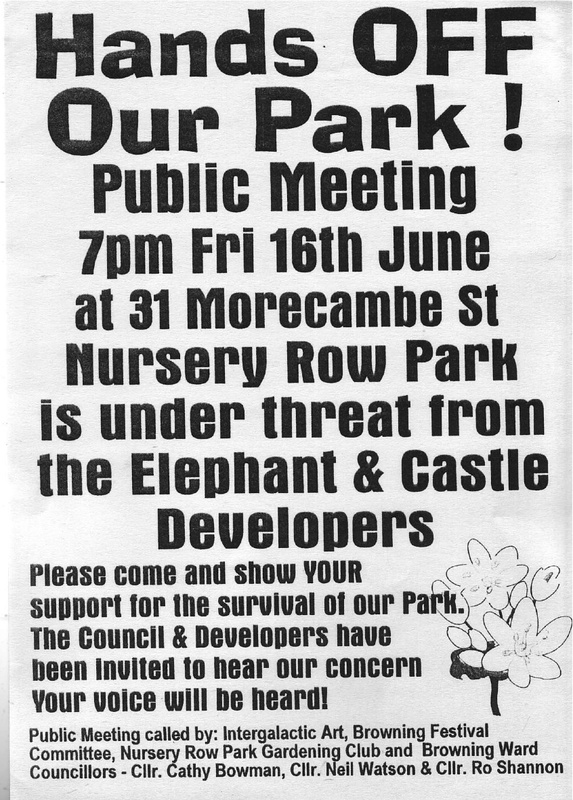 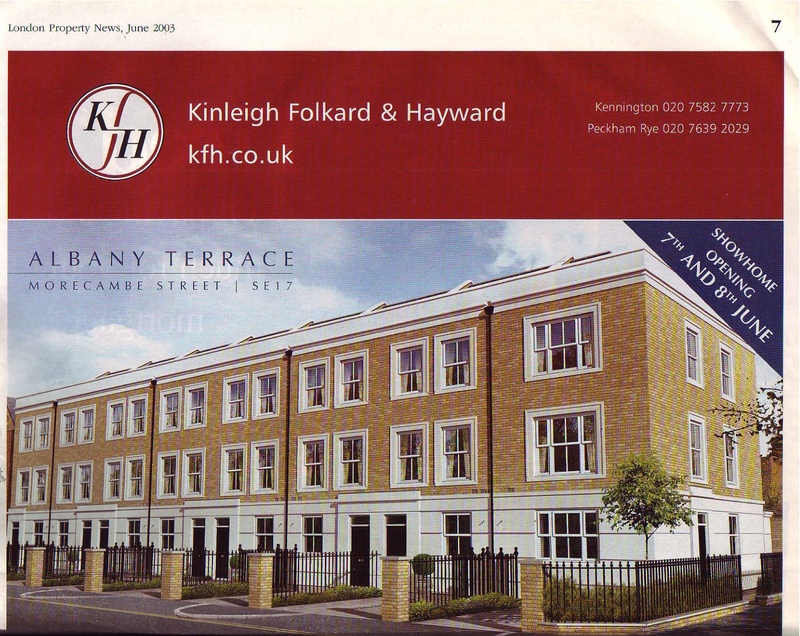 More recenty, the strong local group Friends of Nursery Row Park have been one of the few local amenity groups to stave off developments being built on their park and nearby Rodney Row local shops. 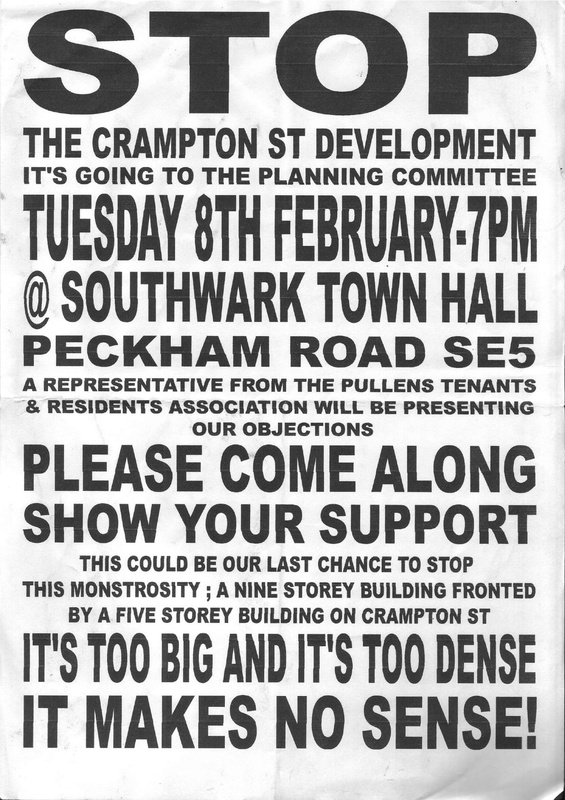 A small campaign by Pullens Estate residents failed to prevent the Oakmayne development on top of the old Newington Industrial Estate on Crampton St. 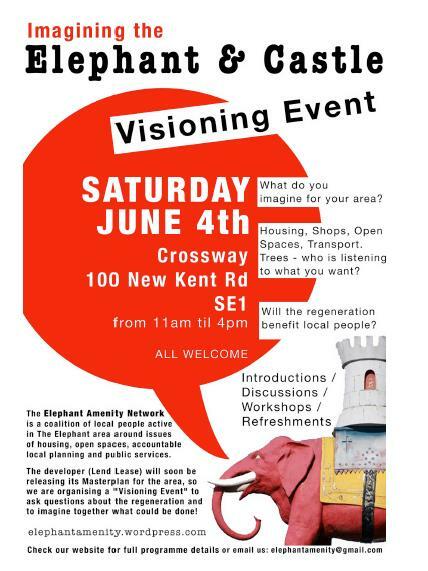 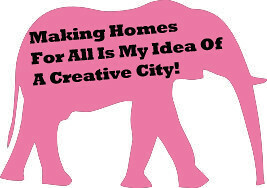 The Elephant Amenity Network has been going for about three years now and is a good solidly local coalition of tenants groups, residents, amentiy groups and local traders. 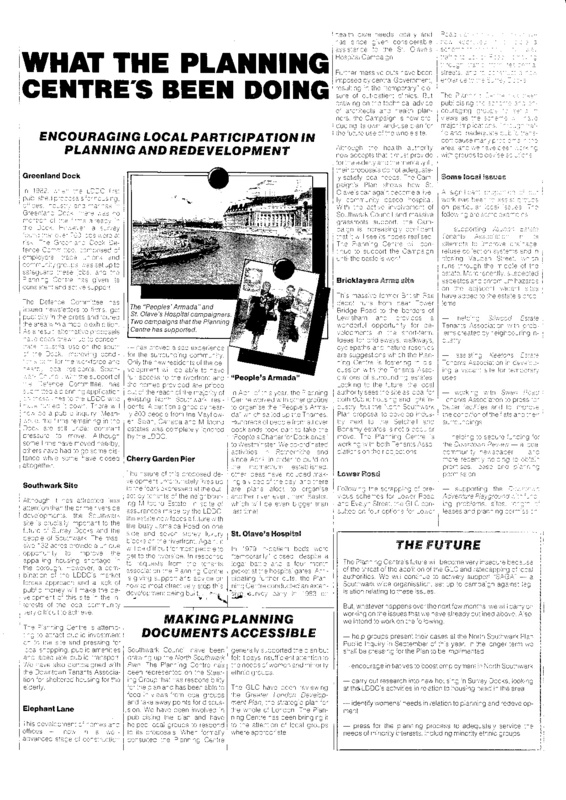 It has been good at following and replying to all the different Council consultations on major planning strategies and other key documents. 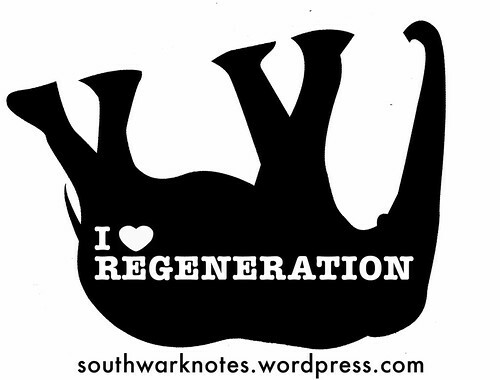 It held a local Visioning Event on June 4th 2011, over 150 local people formulated a different version of regeneration for the local area. 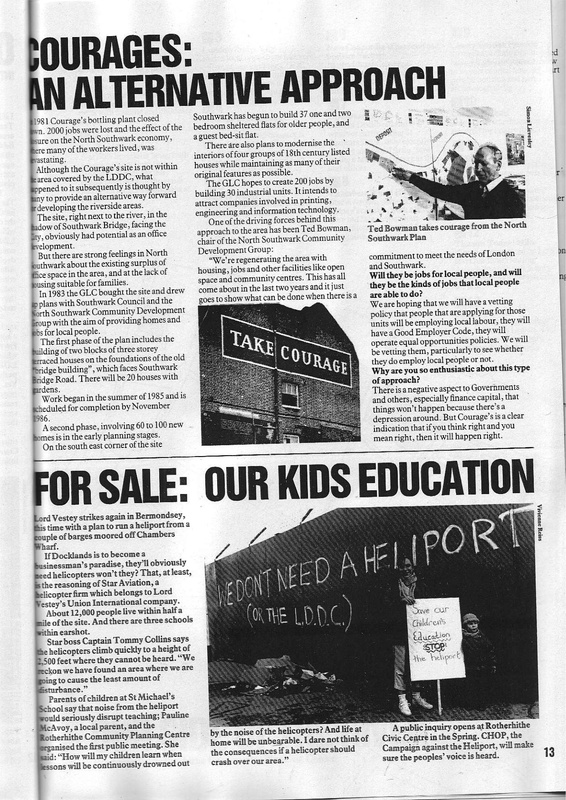 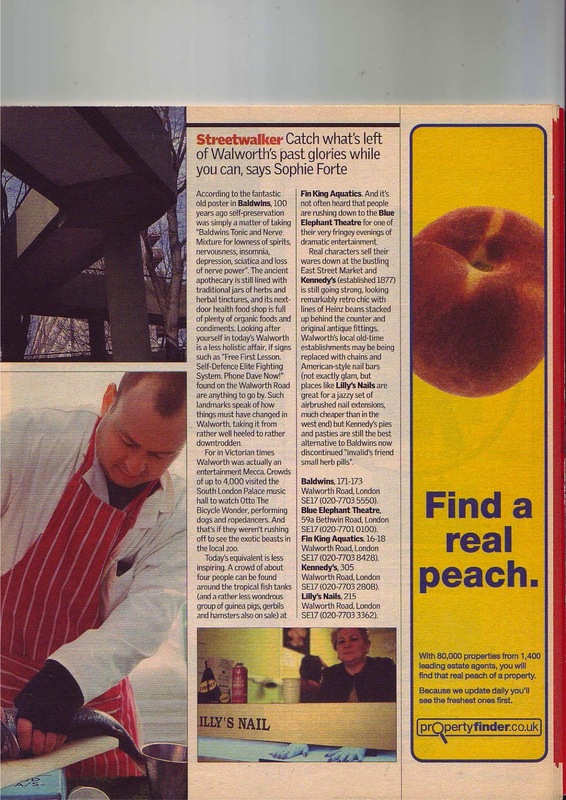 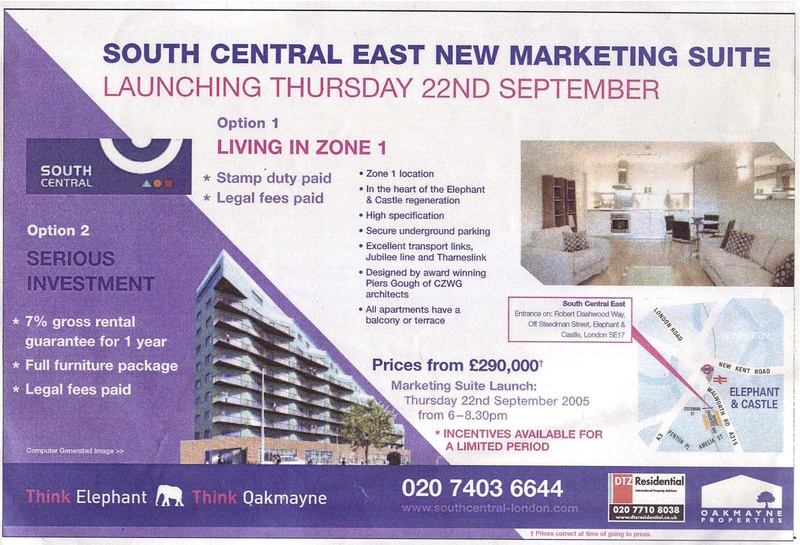 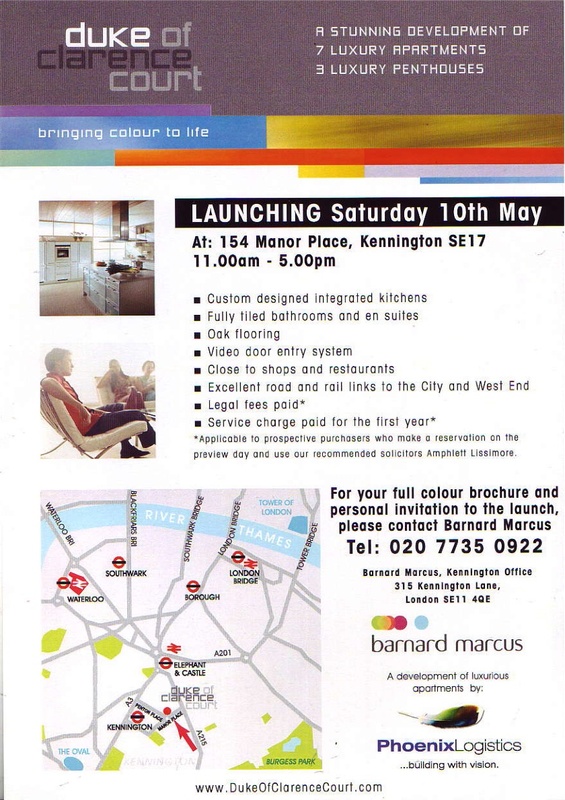 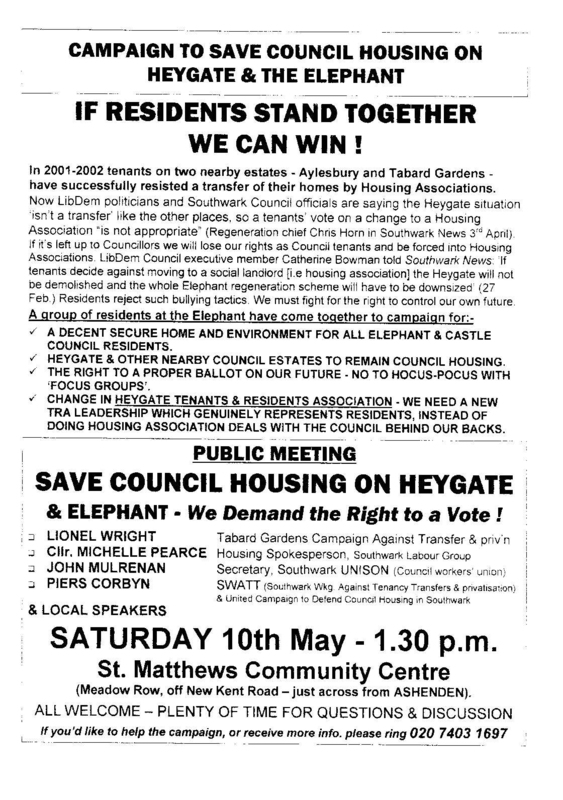 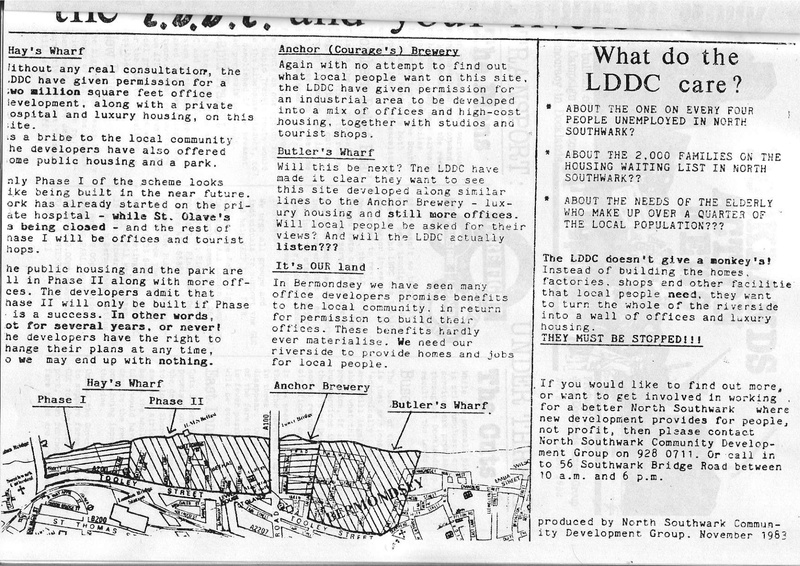 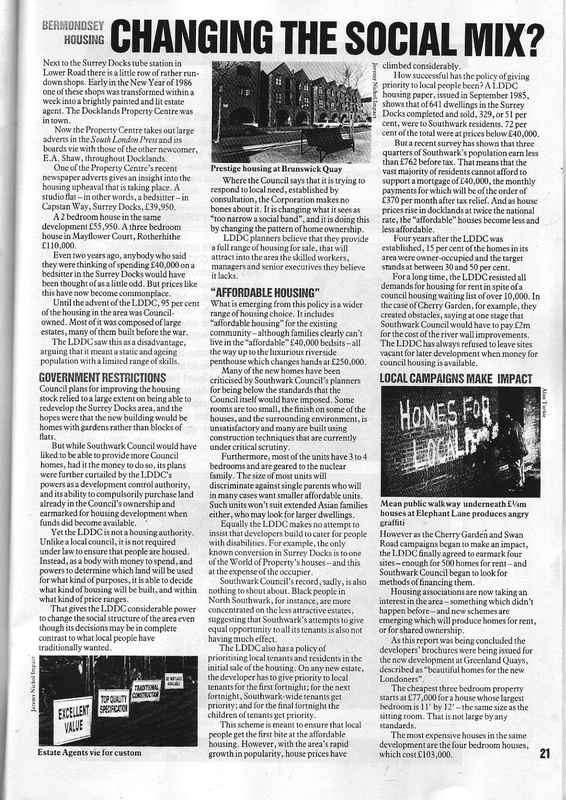 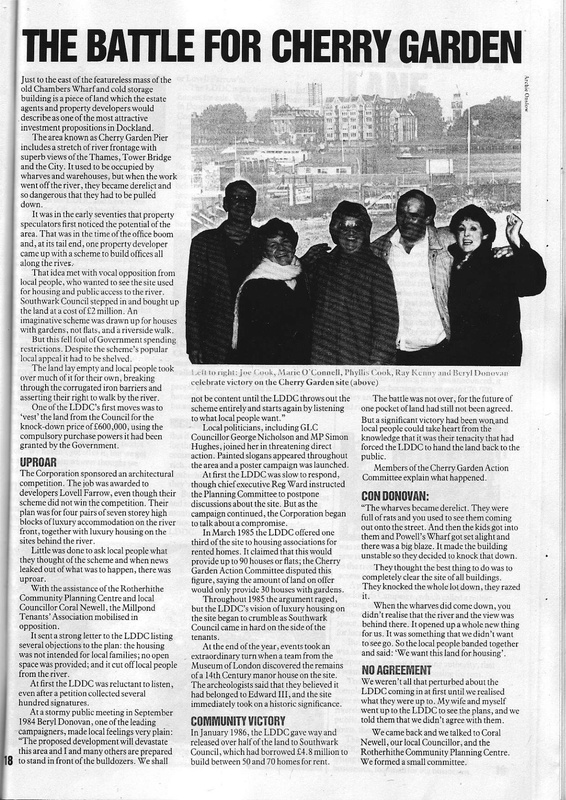 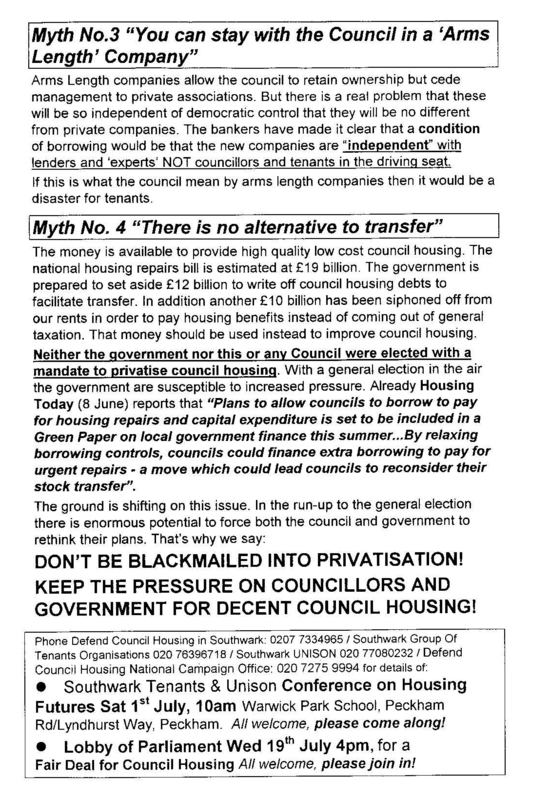 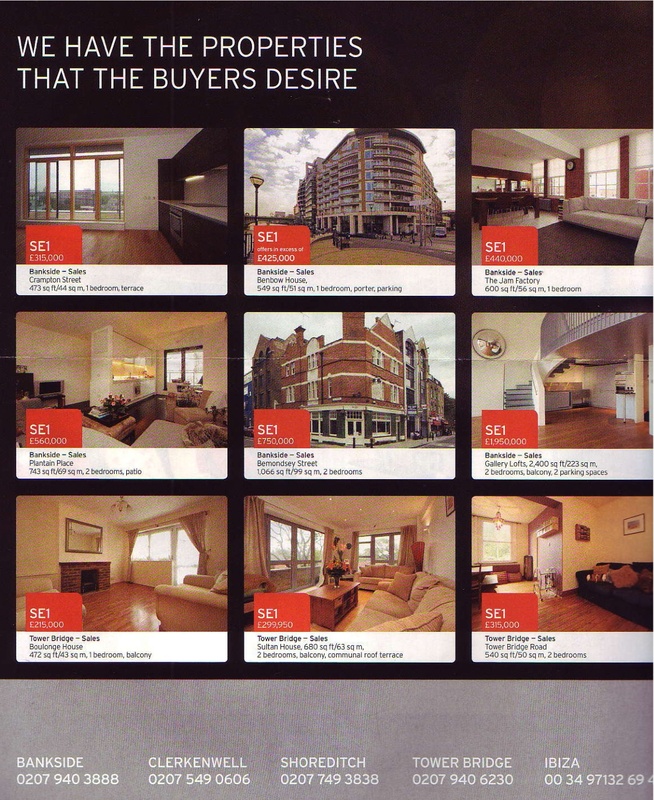 Heygate News 2004 promsing every decanted tenant a HA home in The Elephant / Council promises 16 new build sites of HA for Haygate Tenants. 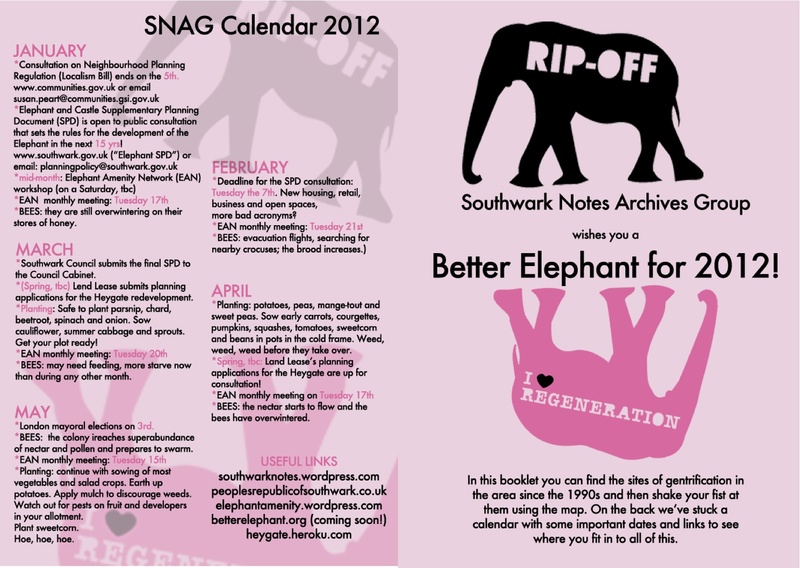 Download Our Recent 2012 Map and Calendar Here!! 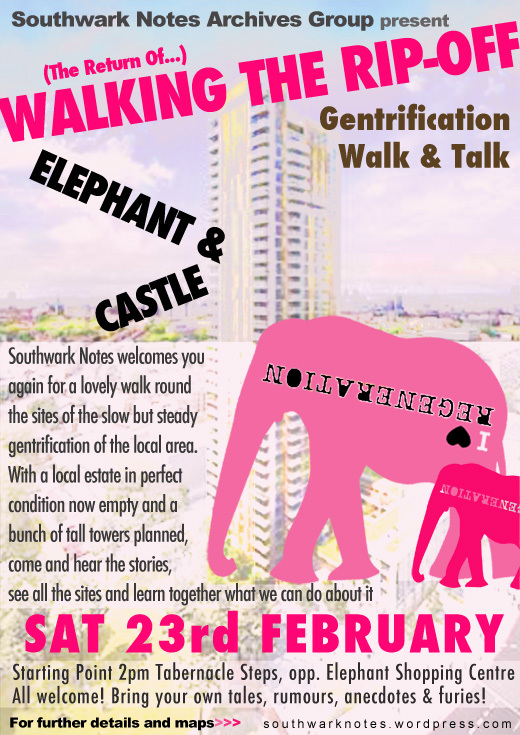 Southwark Notes in real life – our popular walking tours… ongoing! 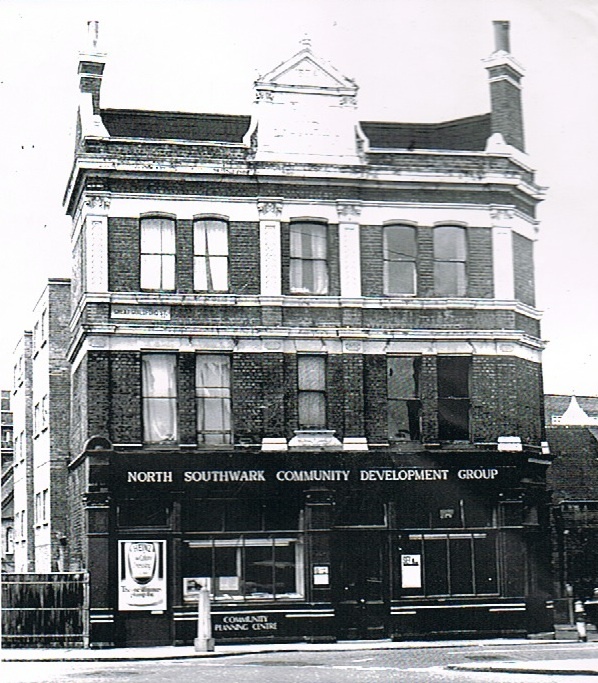 Southwark Notes has been mapping the spread of the new developments and loss of local amenities and pubs in North Southwark since 1999. 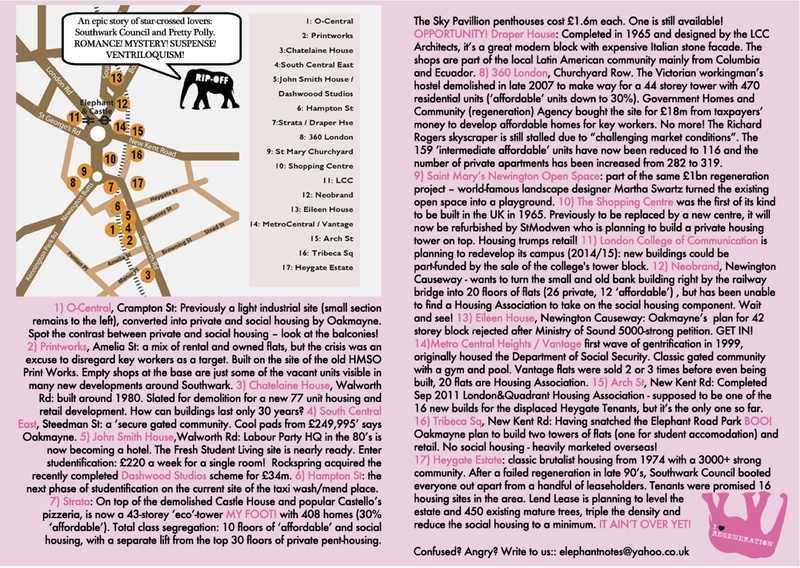 Our photos and notes and documents have now all been put into the 56a Gentrification Archive in 56a Infoshop (see above). 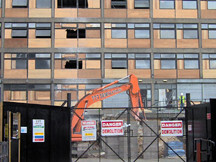 Some of them have now been scanned and put up here. 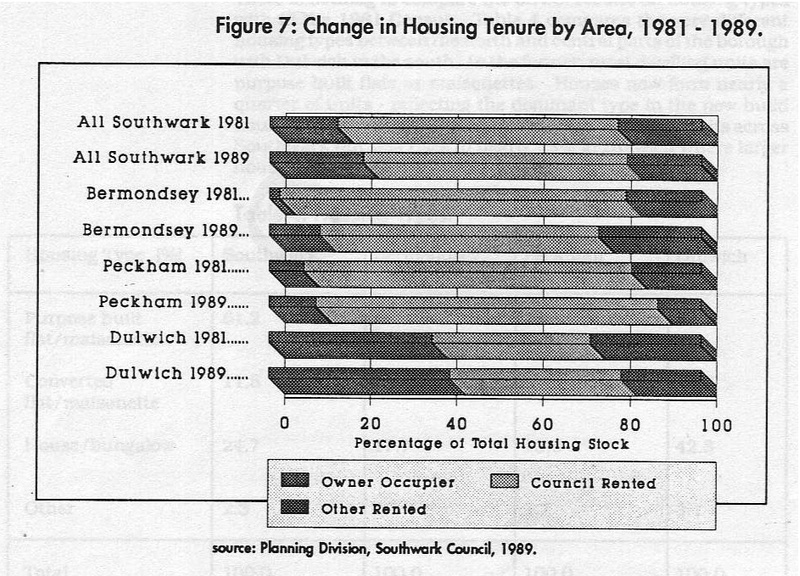 Southwark Housing Tenure 1989 and 2001 – 2010: How many Council homes lost to Right-To-Buy and Sell-Offs? 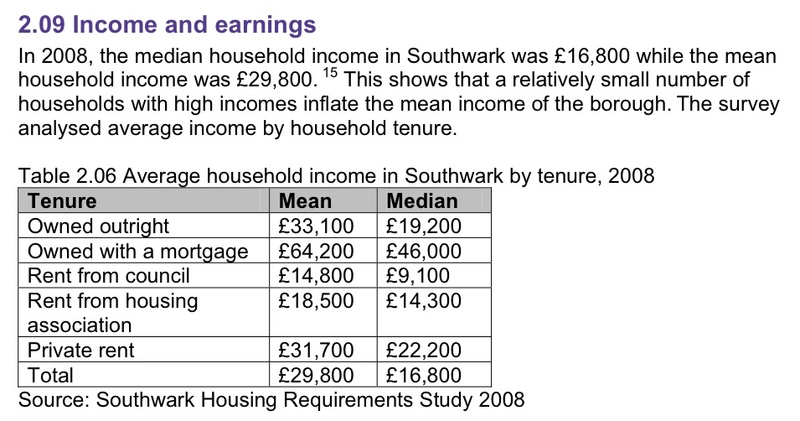 Average incomes by Housing Tenure – It’s still a very poor area!! 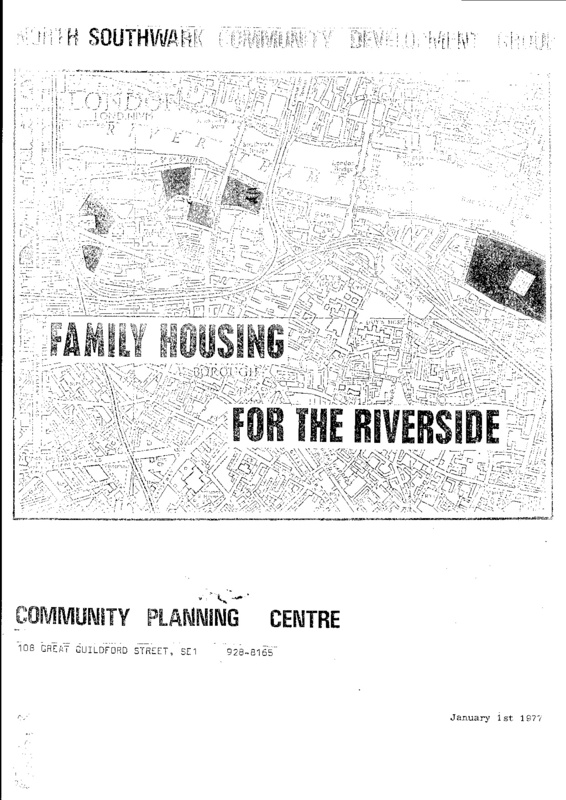 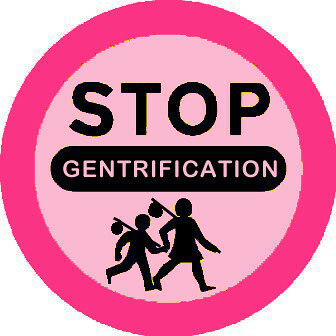 ‘The report says that the council must ‘identify as much potential land as possible for development opportunity’2. 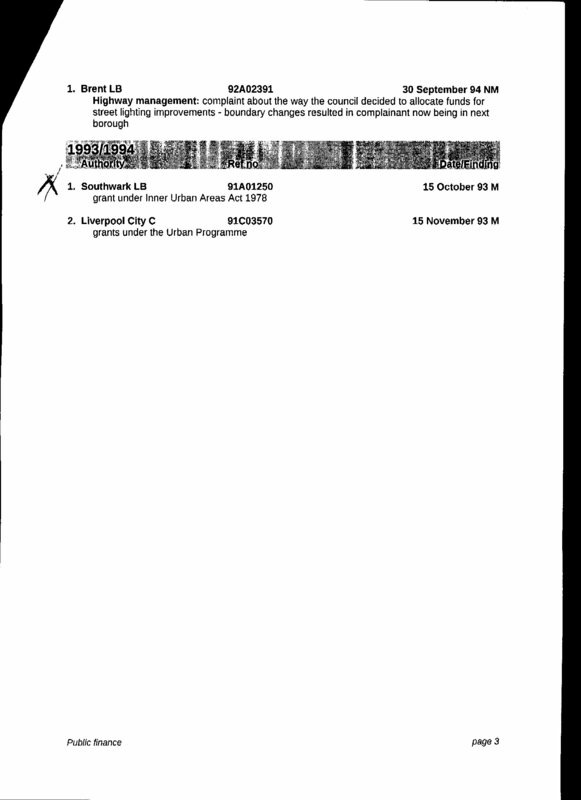 This requires ‘a detailed and comprehensive appraisal be undertaken of the performance of the Housing Revenue Account (HRA) assets’3 (ie council homes), leading to ‘an assessment of their worth to the housing business’4. 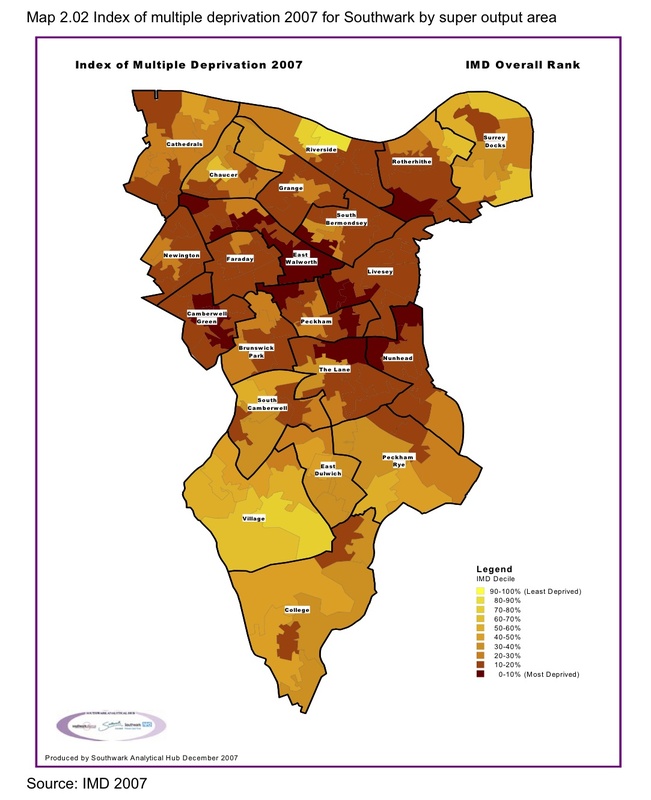 An ‘Asset Performance Evaluation Tool’, which includes ‘a measure of social return based on feedback from engagement with residents’6, will ‘enable’ the council to reach its decisions. 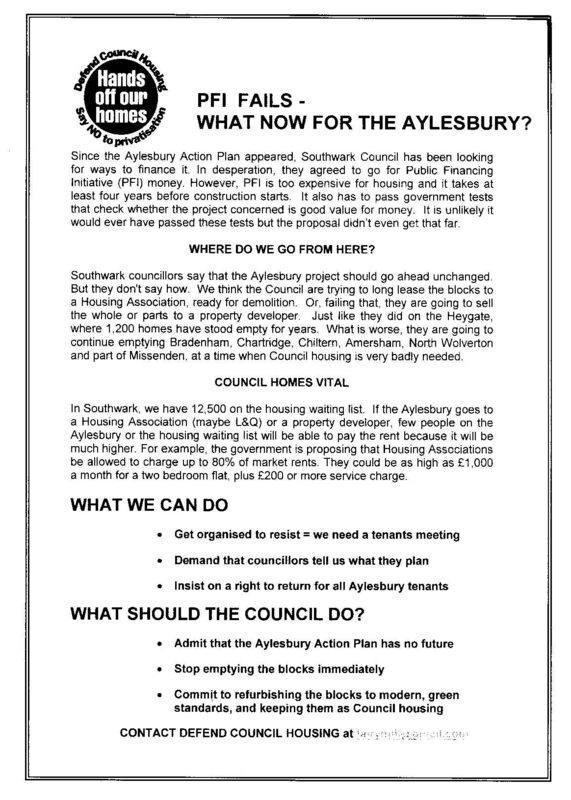 When we hear the words ‘asset management’ we suspect that this means council home sell-offs and more ‘regeneration’ schemes for long term local estates. 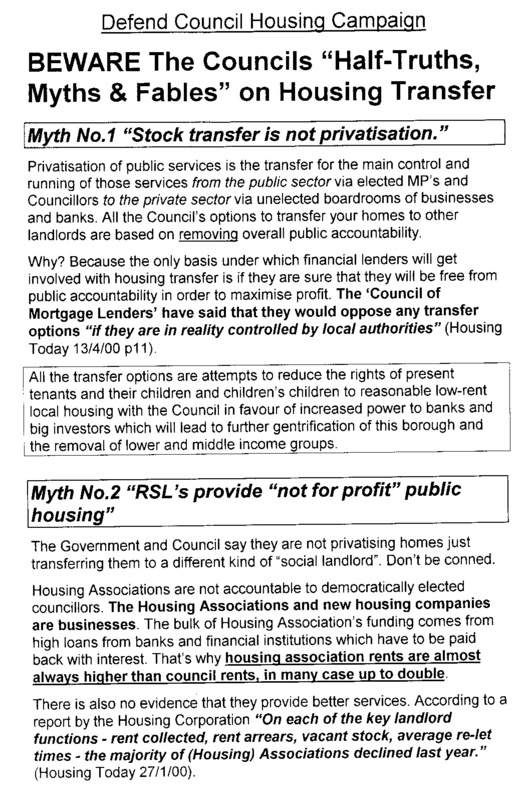 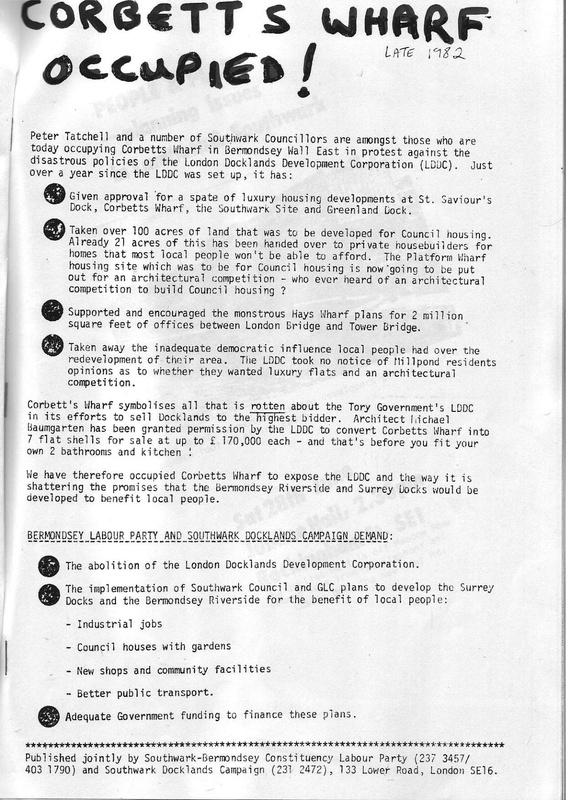 This document could do with some close reading in preparation for some serious hard questions for Southwark. 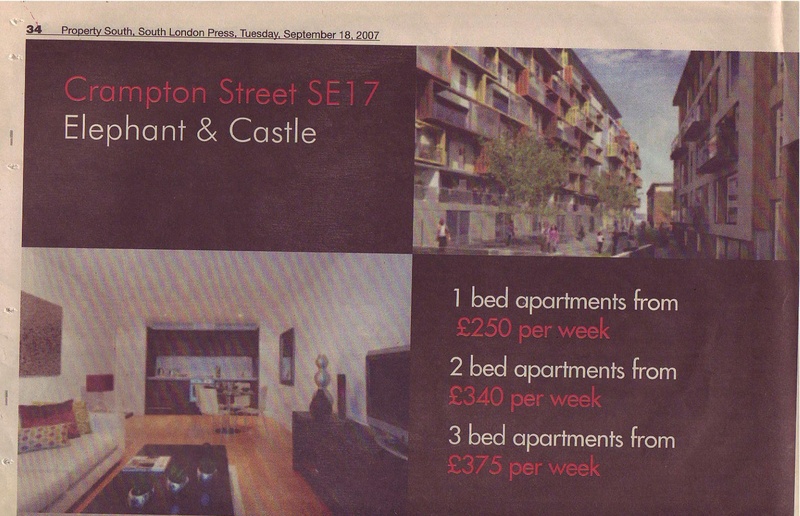 The Council is great at big public relations exercises around this new ‘11,000 council homes’ but evasive on the detail. 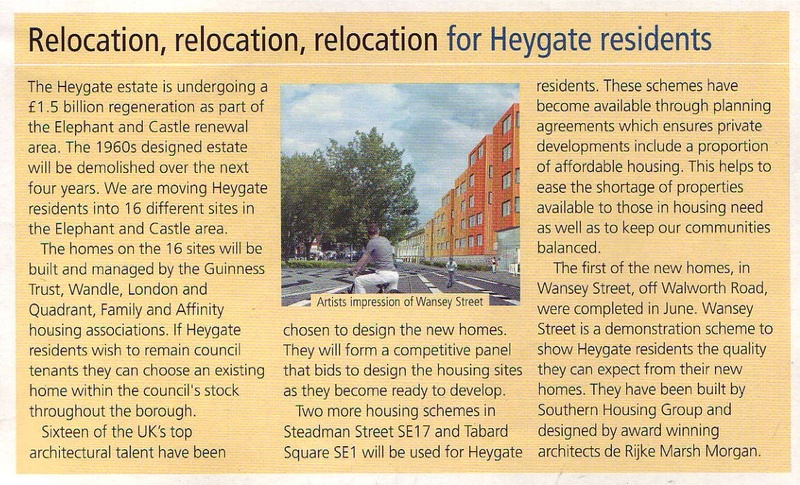 Does the detail reveal that the new homes will be built as part of further regeneration schemes that at once demolish existing estates and result in few council homes at the end (like the schemes at Heygate, Aylesbury, Elmington etc)? 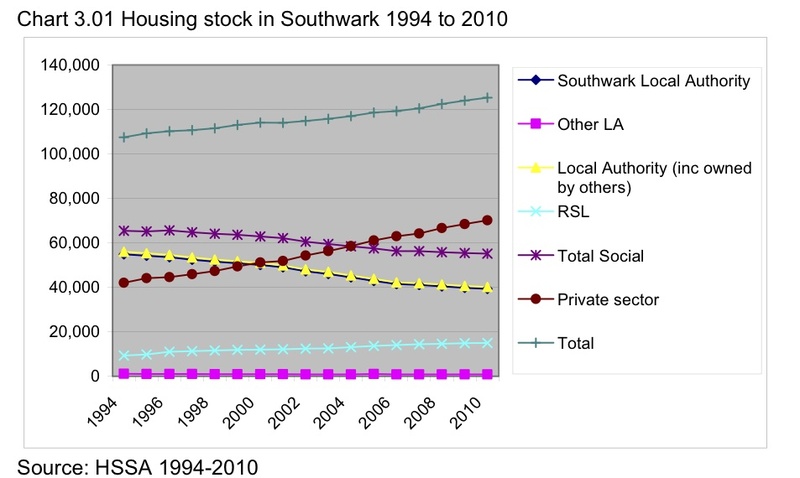 Brilliant Southwark Statistics from Shelter DataBank on Public Housing, Right To Buy, Private Housing and So on here!